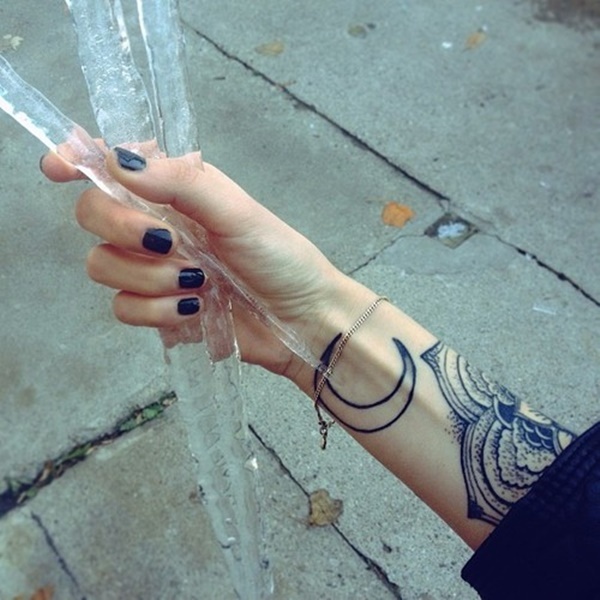 We’ve all caught ourselves staring at the moon; the wondrous celestial body that illuminates the night sky. It is a universal experience to gaze at its rocky terrain from the confines of earth and imagine the vastness of space. 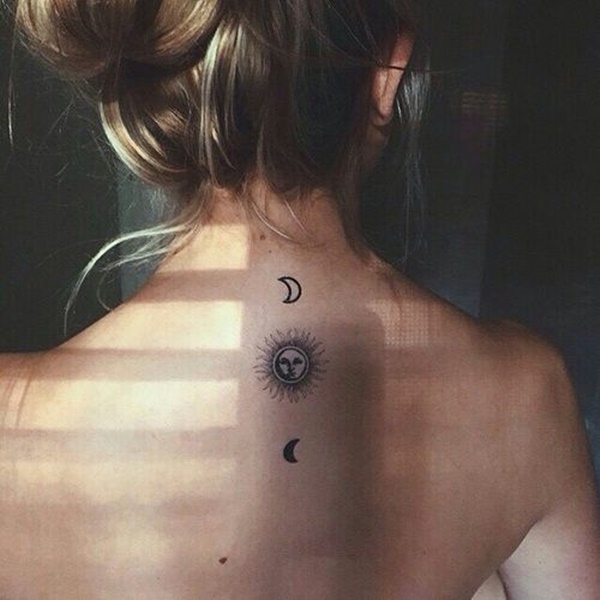 The moon represents the antithesis of the sun. 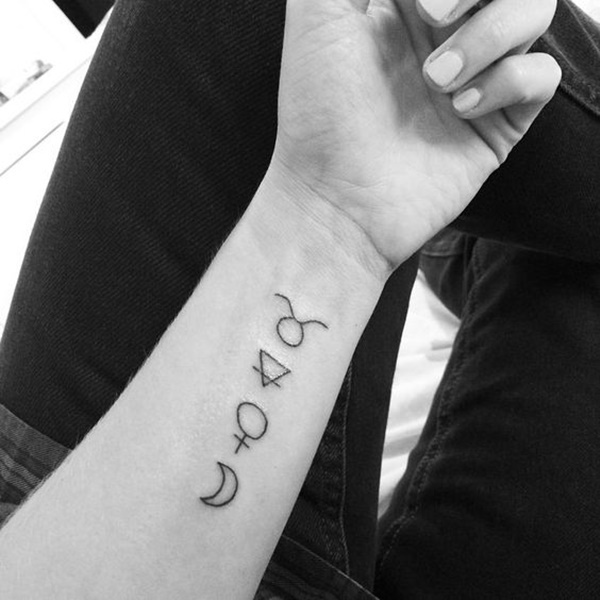 The cosmic counterpart signifying an ultimate balance throughout the universe. Every person that walks this planet is guilty of staring at the moon with wide eyes and a craned neck, hypnotized by the idea of an entity so massive and bleak revolving around the earth. Subsequently, this fascination with the gray rock, which holds the distinction of being the largest planetary satellite relative to the size of the planet it orbits, has influenced our art. 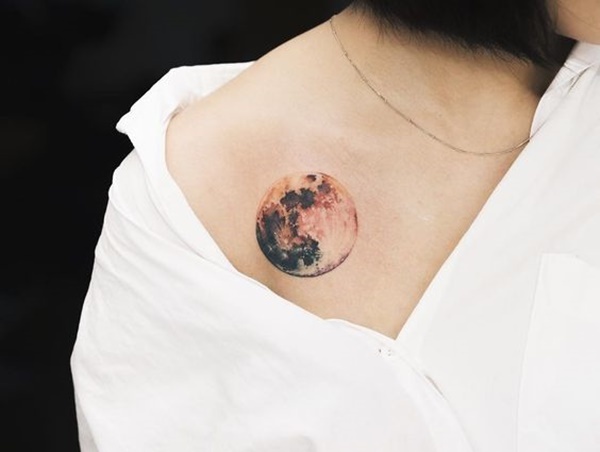 In this article we review symbolic and realistic moon tattoos and decipher the difference between a floating rock and a cosmic masterpiece. 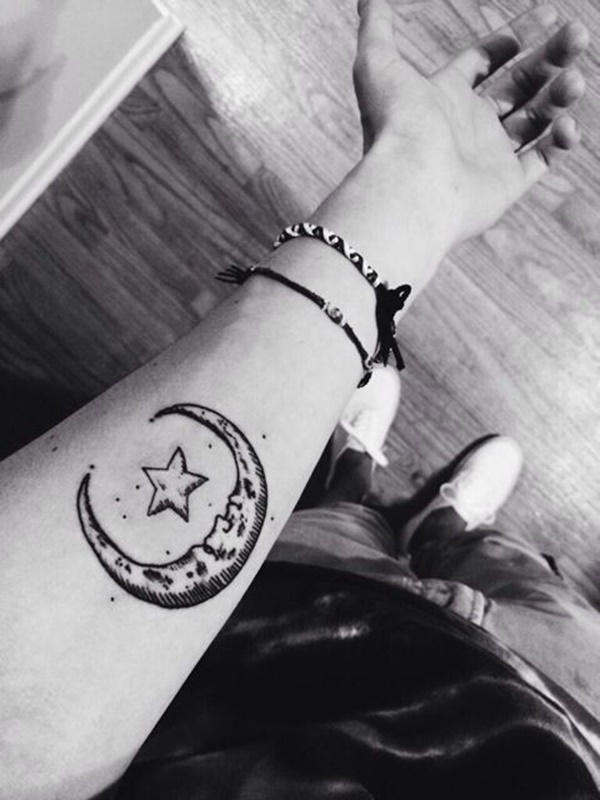 This tattoo, depicted in black ink on the wearer’s forearm, renders a crescent moon wrapping around a star. 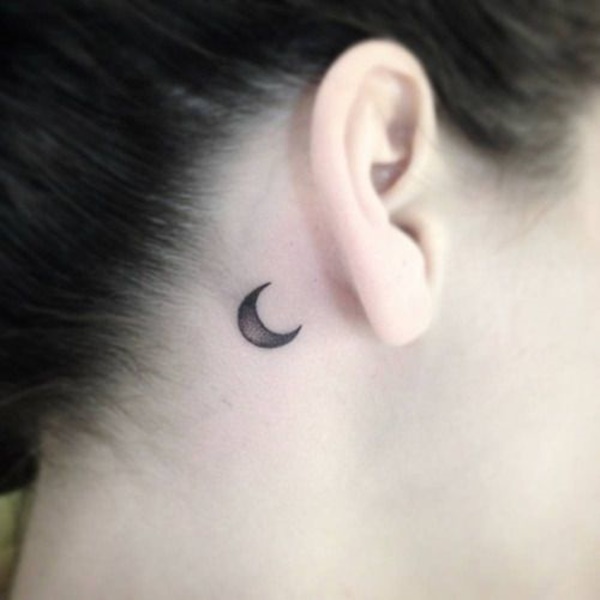 A crescent moon is rendered behind the wearer’s left ear in this tattoo. 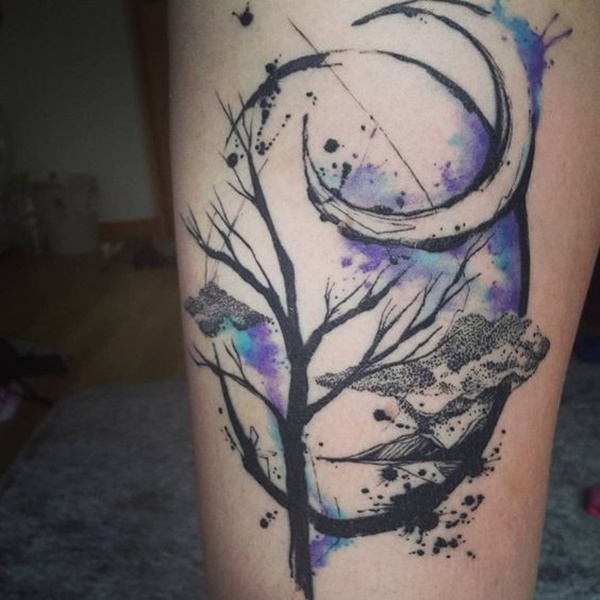 A barren tree creates the foreground while a crescent moon creates the background of this abstract tattoo that utilizes smears of blue and purple watercolors. 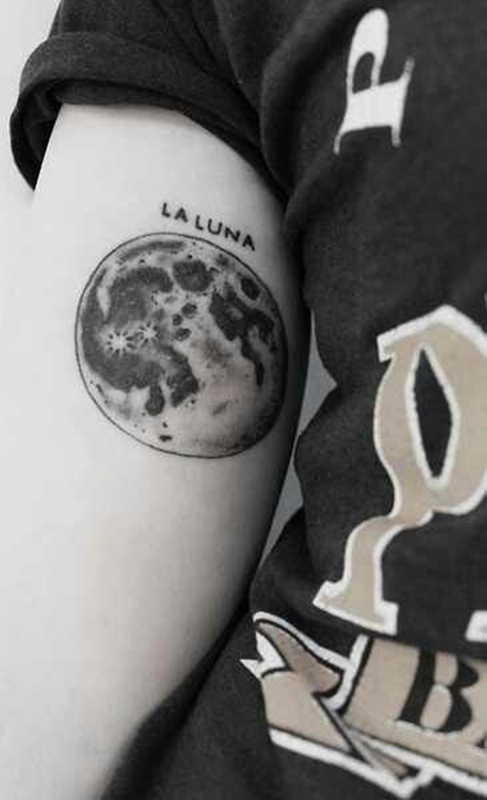 A realistic moon is depicted on the inside of the wearer’s upper right arm with the quote, “La Luna,” reading above the image. 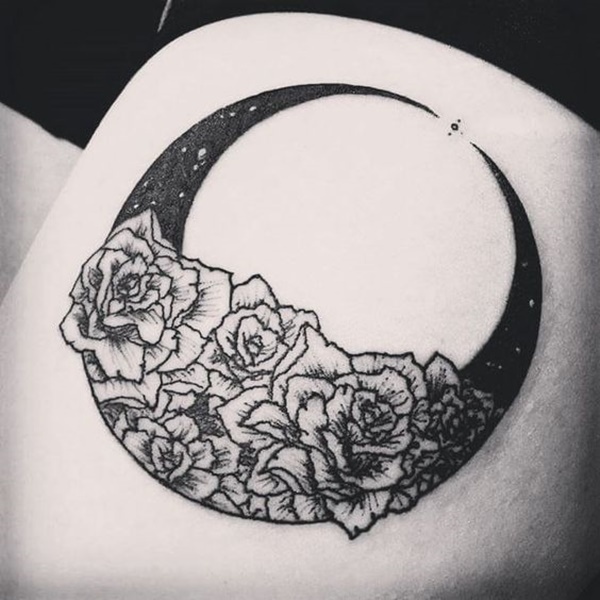 A crescent moon embellished with roses in the center is laid on its side in this black and gray tattoo. 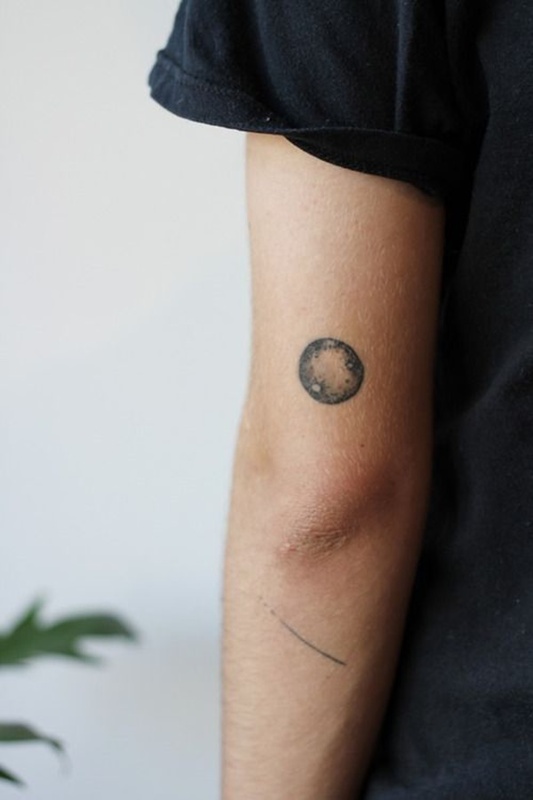 While not a moon, this tattoo has an intriguing concept. 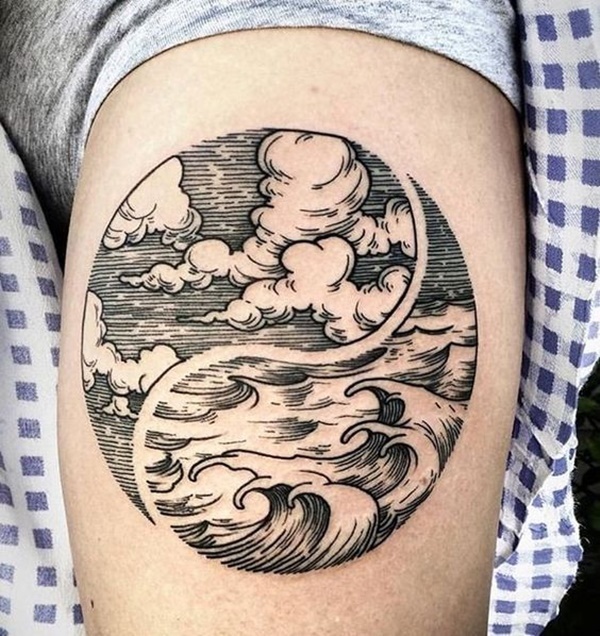 A yin-yang has the traditional black and white design replaced with the elements of wind and water. 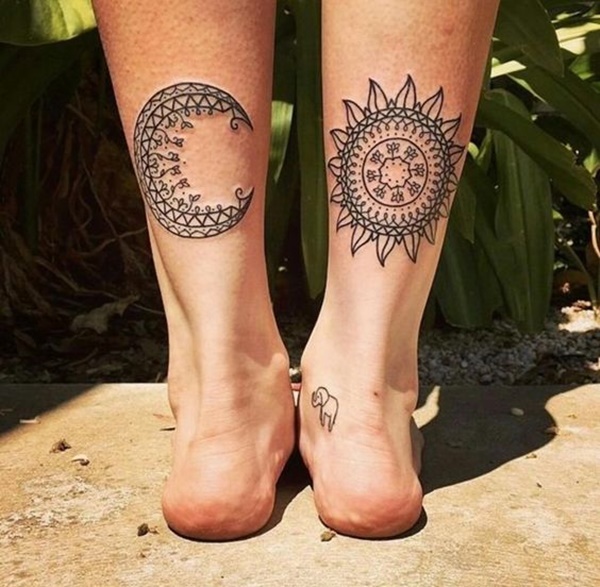 Elements of mandalas are used to create the images of a crescent moon and a sun on the wearer’s calves in this black and gray tattoo set. 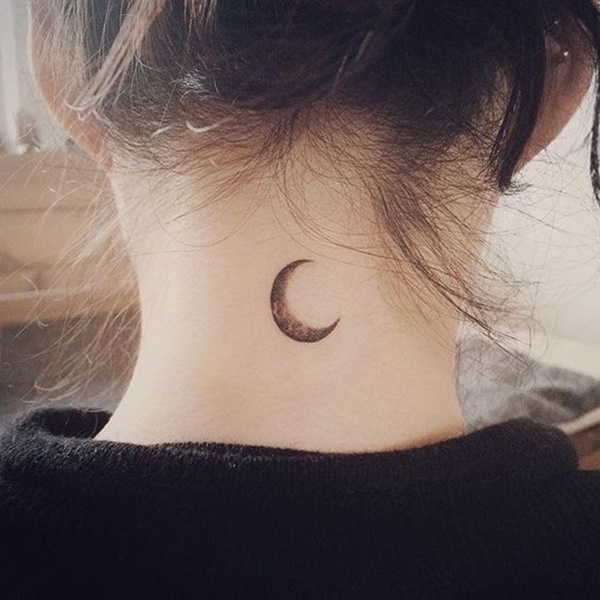 A personified crescent moon is embellished with a trio of stars in this black and gray tattoo rendered behind the wearer’s right ear. 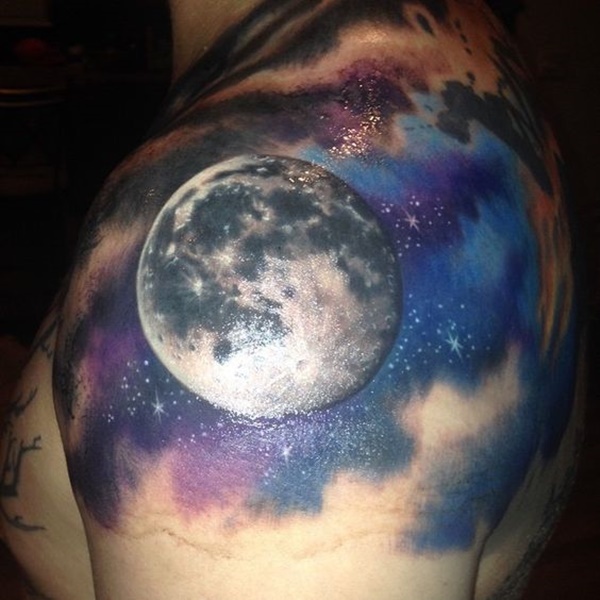 A hyper-realistic moon is depicted among a smear of blues and purples meant to replicate the colorful tapestry of the cosmos in this piece rendered on the wearer’s left shoulder. 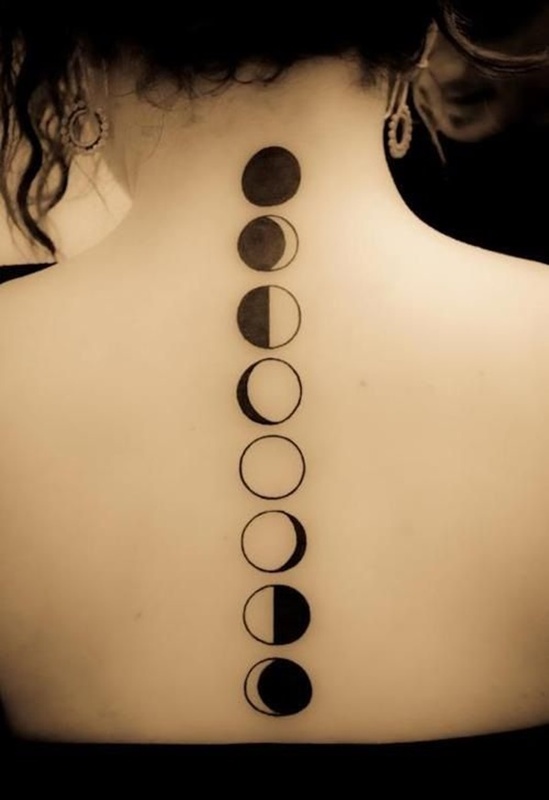 A chart depicts the multiple stages of the moon running along the wearer’s spine in this tattoo. 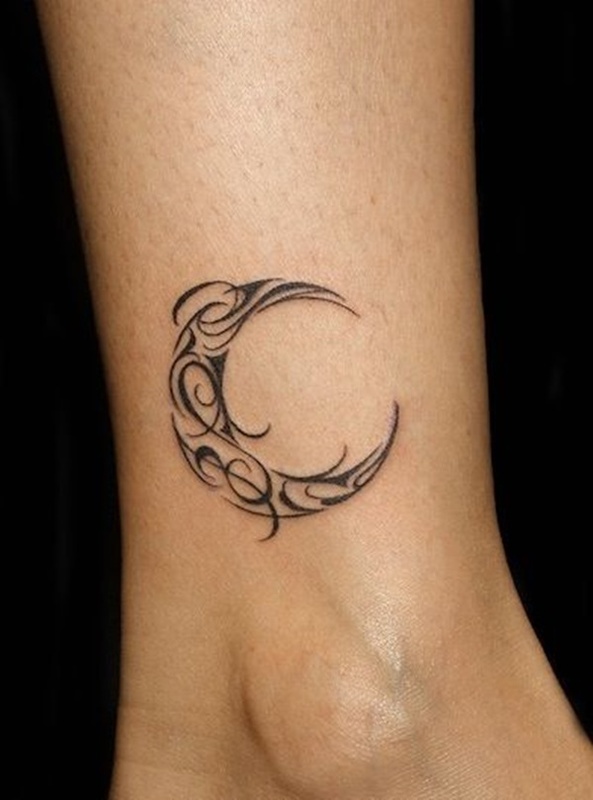 A tribal inspired design comprises the shape of a crescent moon in this black tattoo rendered on the inside of the wearer’s leg just above the ankle bone. 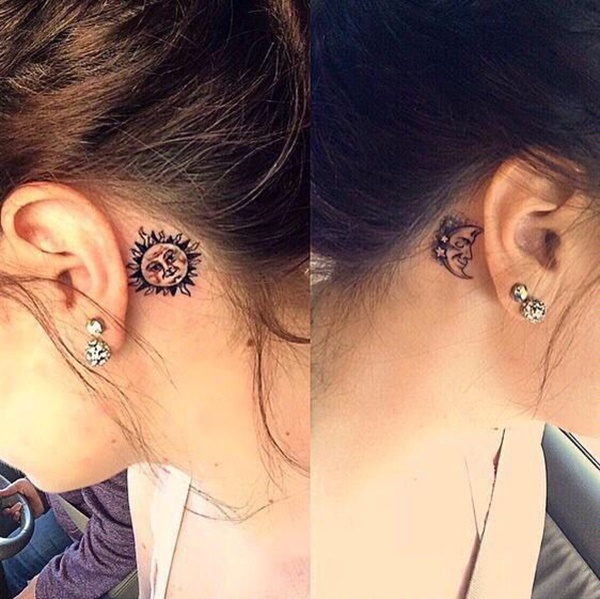 A crescent moon is surrounded by the design of a tribal sun in this tattoo set that uses reversed colors to differentiate between the pieces. 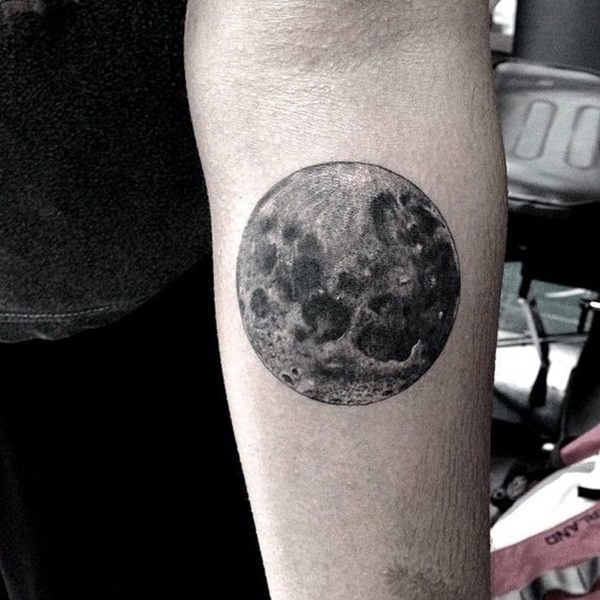 A miniature black and gray moon is depicted on the back of the wearer’s left arm just above the elbow in this tattoo. 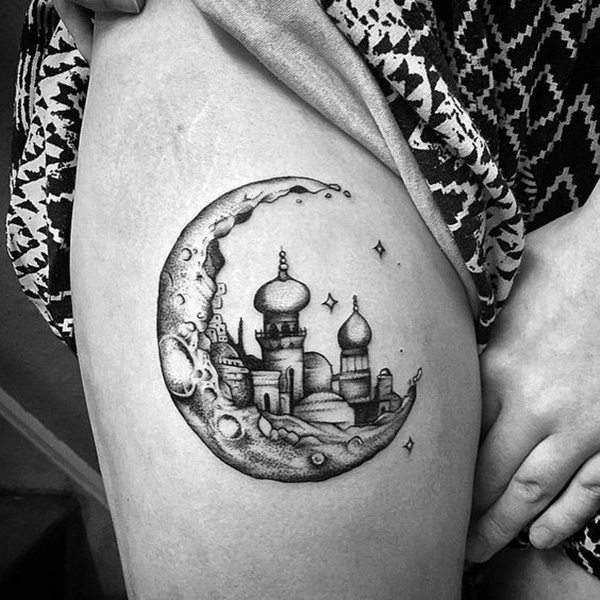 This black and gray tattoo uses a crescent moon to frame the skyline of the Taj Mahal while the image is embellished with a few sparkling stars. 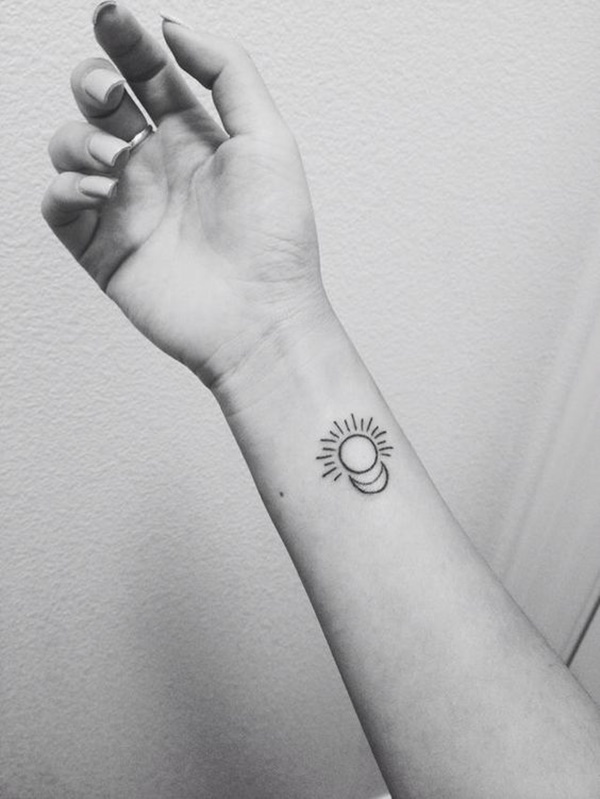 A simplified version of a crescent moon and the sun are rendered on the wearer’s wrist in black ink in this tattoo. 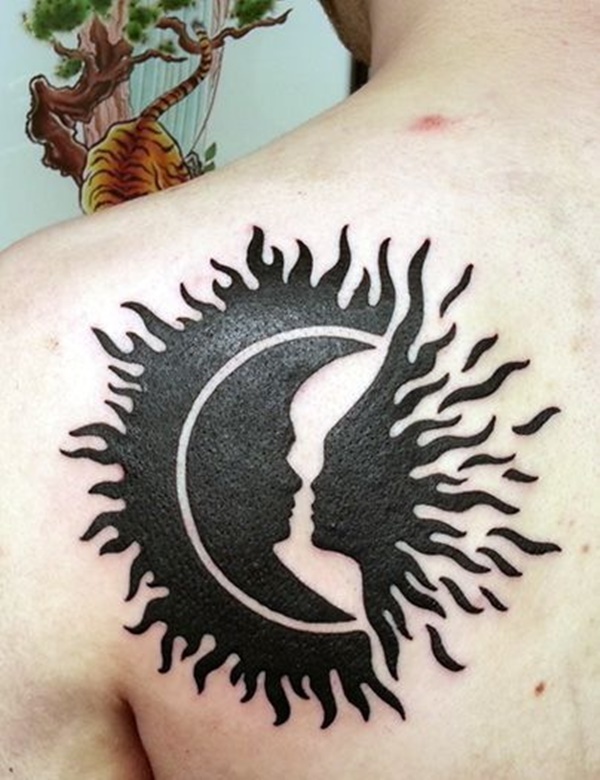 Shading is used to create the image of a black crescent moon in this tattoo rendered on the back of the wearer’s neck. The uneven distribution of the ink in the piece creates texture and complexity that separates this piece from its counterparts. 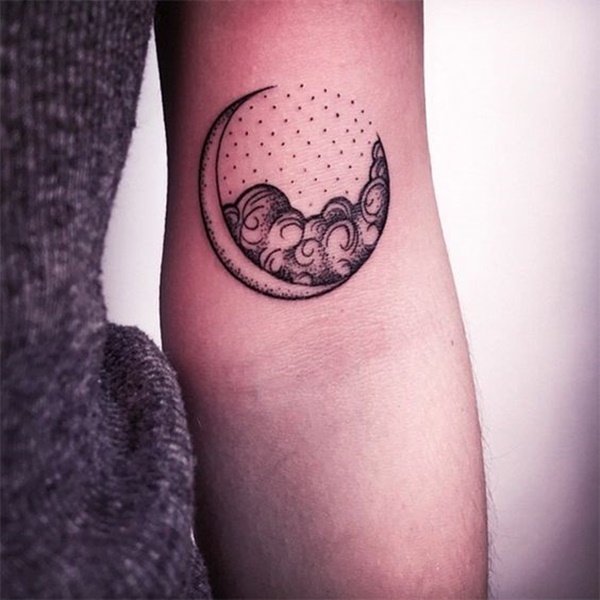 The moon is created using a bold outline and texture is added with a series of dots in this black and gray tattoo rendered on the wearer’s forearm above the elbow. 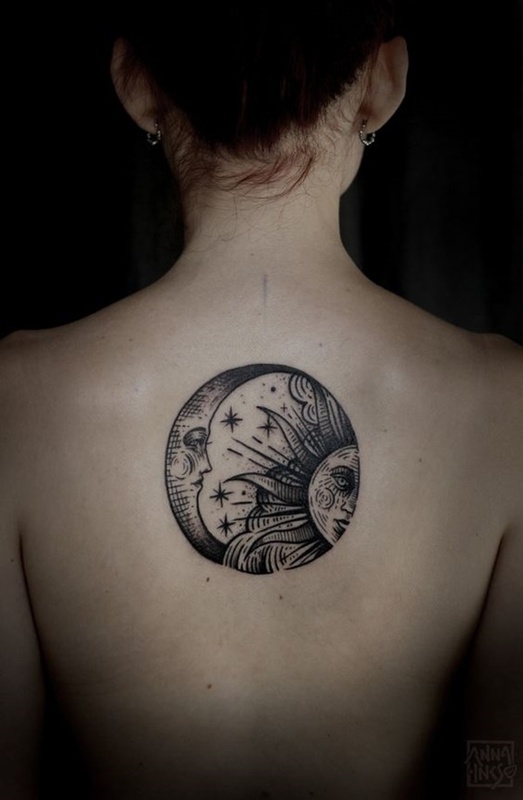 This hyper-stylized piece encapsulates a crescent moon and sun inside of a circle in the middle of the wearer’s back between the shoulder blades. 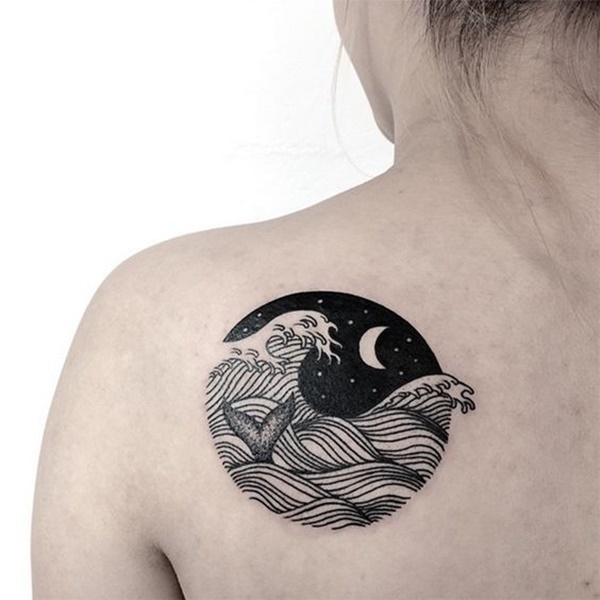 Mindful line-work is used to create texture in the piece and stars are used to fill the negative space between the two images. 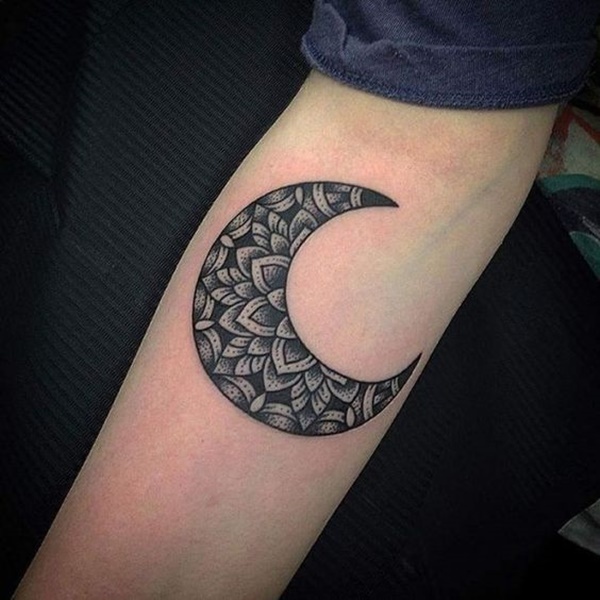 A crescent moon is adorned with patterns often seen in a mandala in this black and gray tattoo rendered on the wearer’s upper arm. 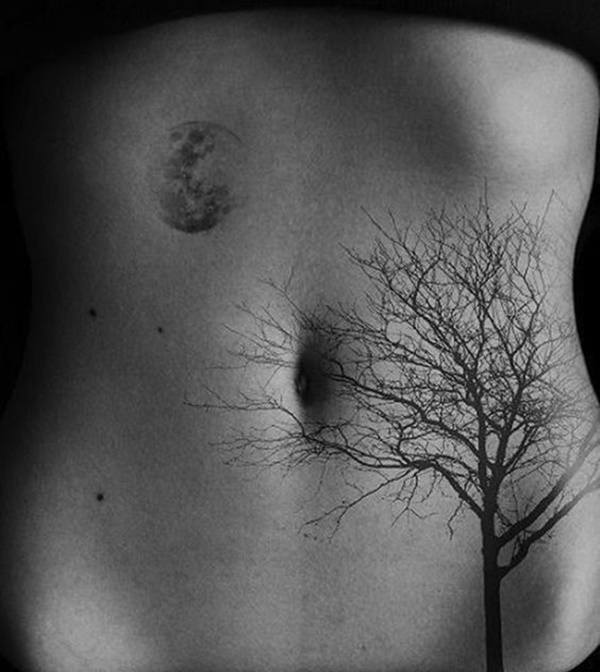 A barren tree is depicted being loomed over by a hyper-realistic moon in this striking scene rendered on the wearer’s stomach. 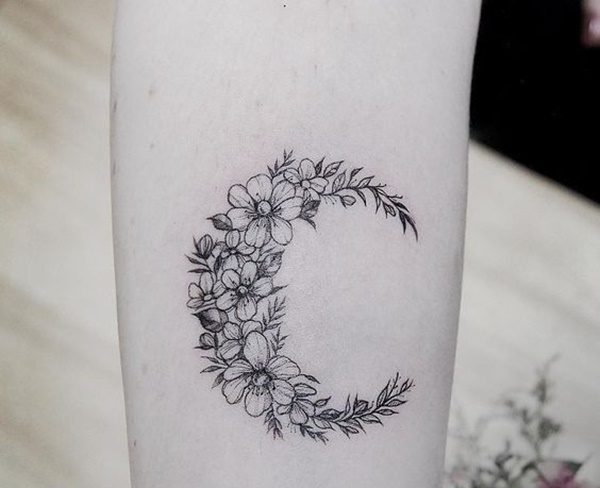 Flowers are used to comprise the shape of a crescent moon in this unique piece that combines different elements of nature. 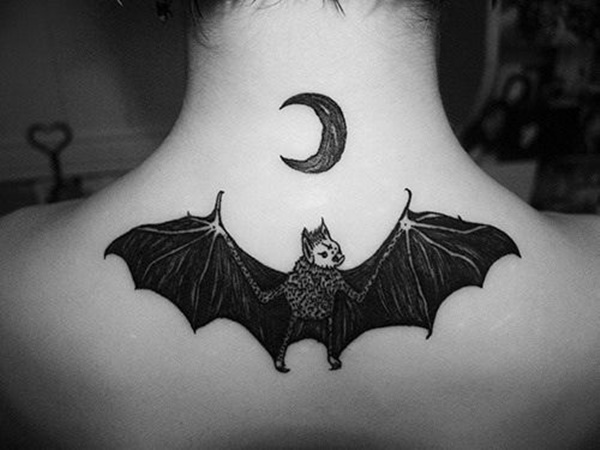 A black crescent moon is imagined above a bat with spread wings in this tattoo shown at the base of the wearer’s neck. The moon creates the background of this desolate scene that focuses on barren trees in the foreground rooted in cubes at the base of the image. 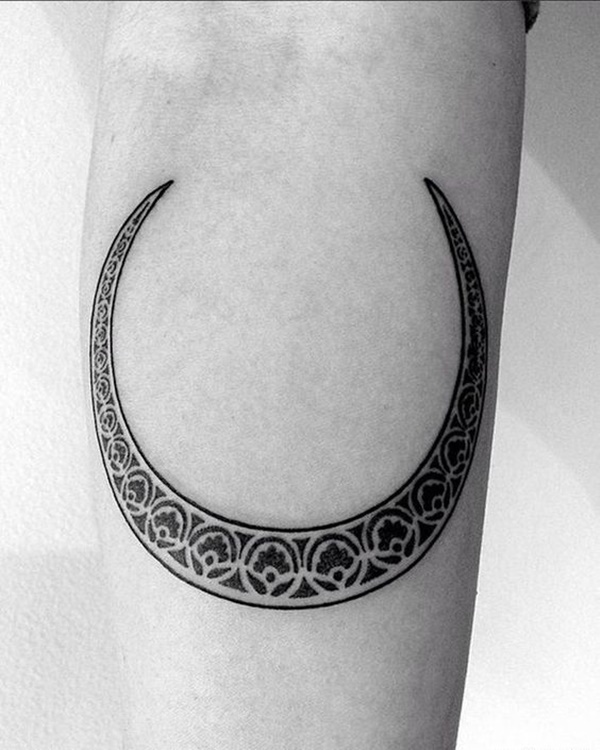 A small black crescent moon is depicted on the wearer’s wrist in this simple tattoo. 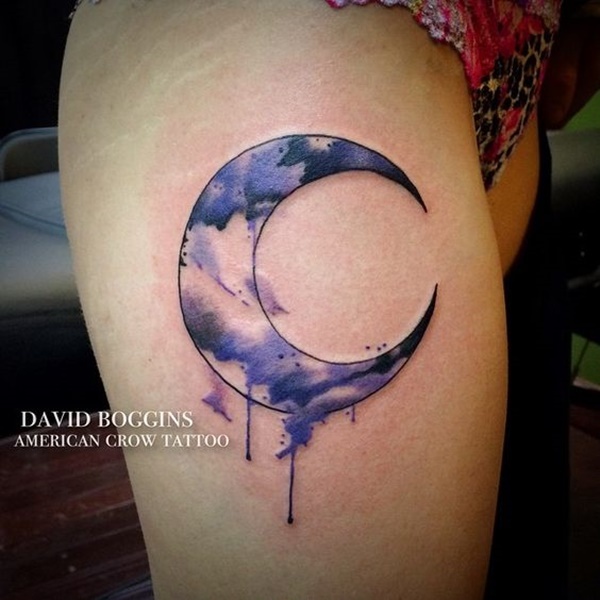 A crescent moon is smeared with purple and black watercolors in this tattoo rendered on the wearer’s thigh. 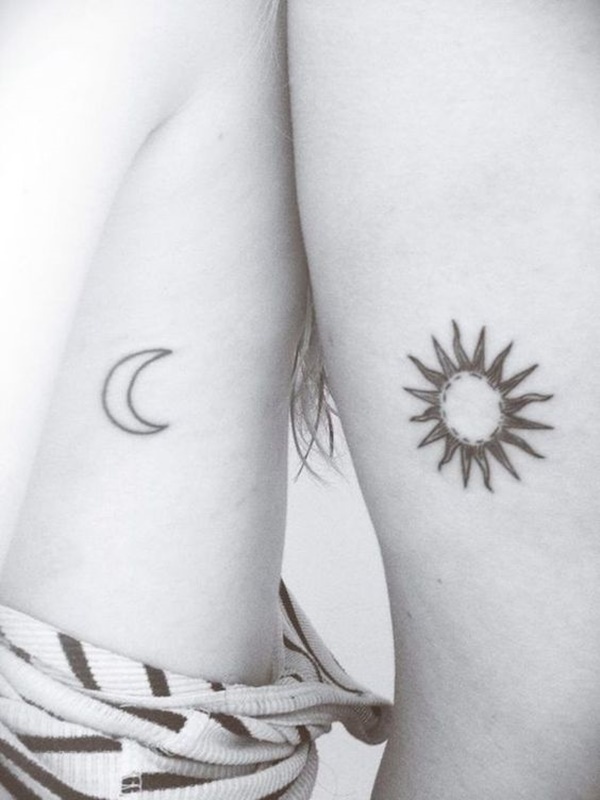 Simplistic depictions of a crescent moon and sun are rendered in the center of the wearer’s back in this tattoo set. 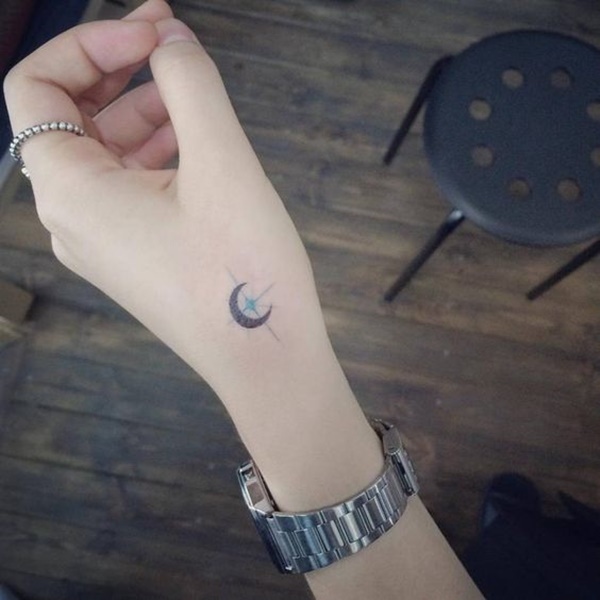 A black crescent moon is backed by a blue star in this simple tattoo inked onto the wearer’s left hand. 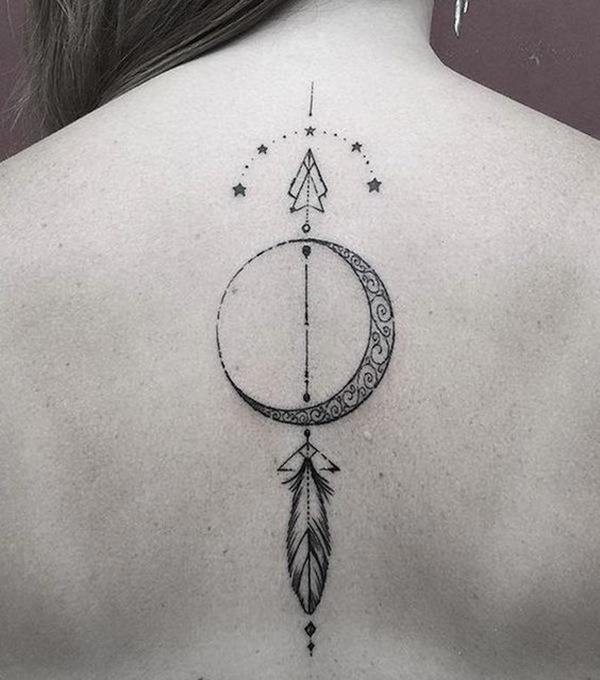 A crescent moon creates the centerpiece of this tattoo and is embellished with a feather, multiple stars, and a few nonsensical designs. 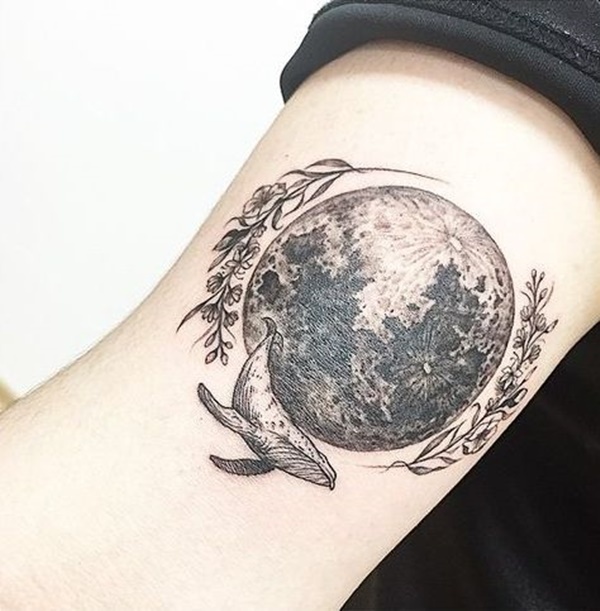 A moon functions as the centerpiece of this tattoo that couples seemingly non-related images including flowers and a blue whale. 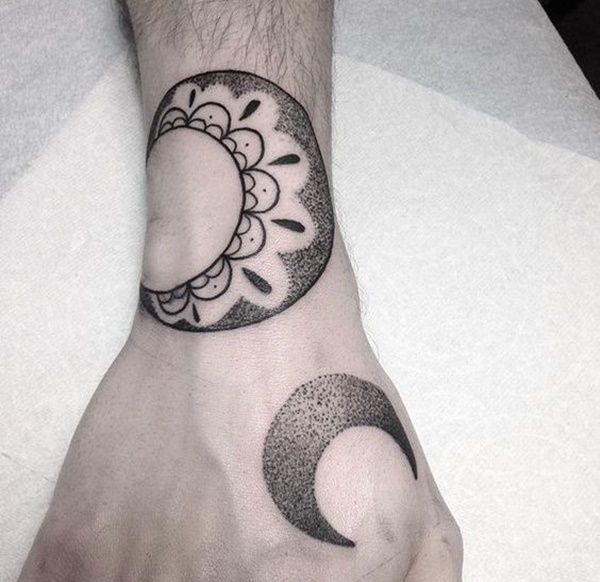 A crescent moon is embellished with elements of a mandala in this black and gray tattoo rendered on the wearer’s forearm. 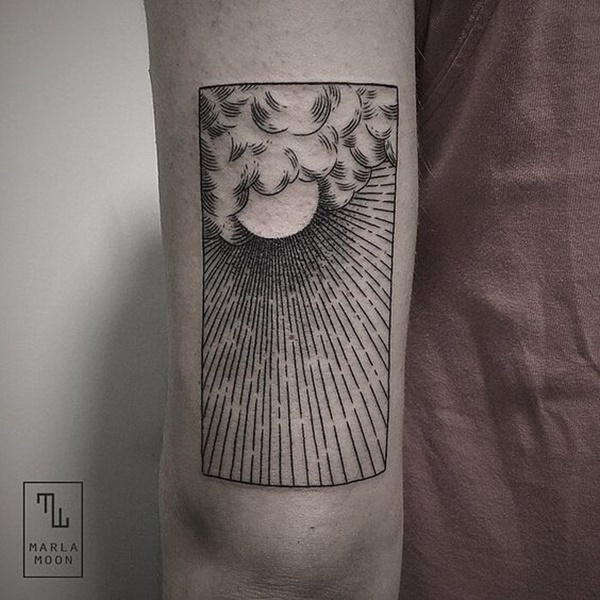 A rectangular vignette encapsulates the image of a sun shining through the clouds while the sun-rays shine into the distance. 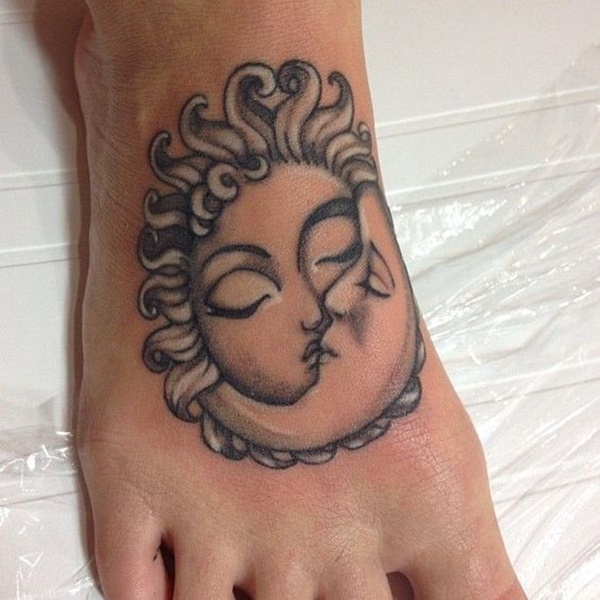 This black and gray tattoo shows a personified sun and moon kissing and is depicted on the top of the wearer’s of right foot. 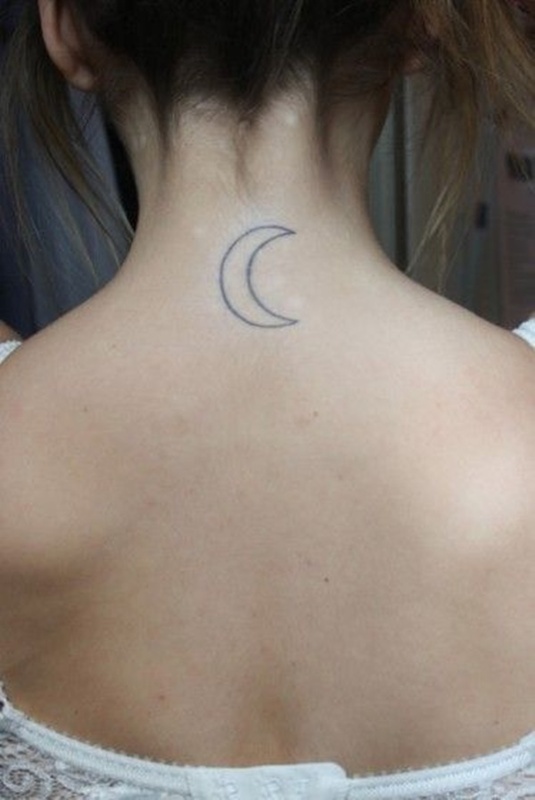 A crescent moon is created using a black outline in this tattoo depicted at the base of the wearer’s neck. 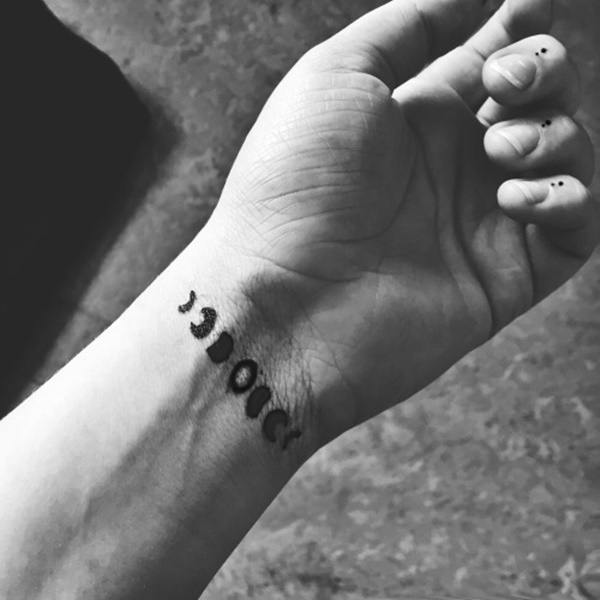 This tattoo set, depicted on the wearer’s forearms, renders a sun and crescent moon in black ink. This black and gray moon relies too heavily on dark colors that wash out the detail for observers that are looking at the piece from a distance. 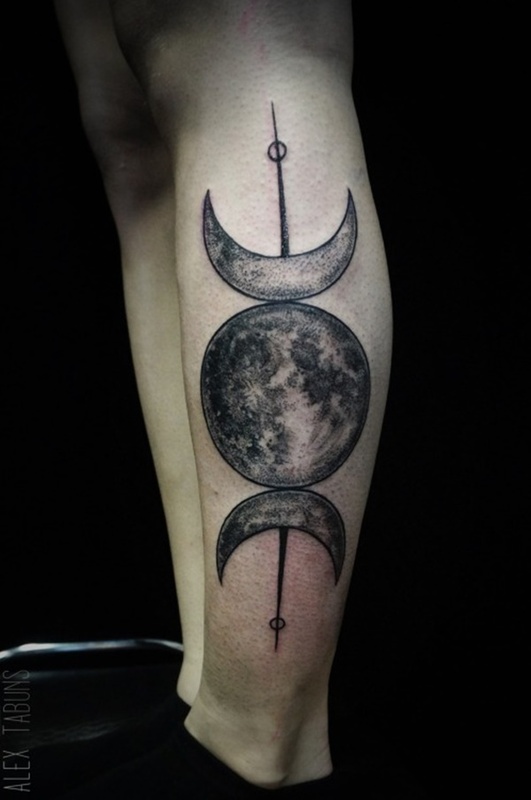 A realistic depiction of the moon is used to show the various cycles of the moon waxing and waning. 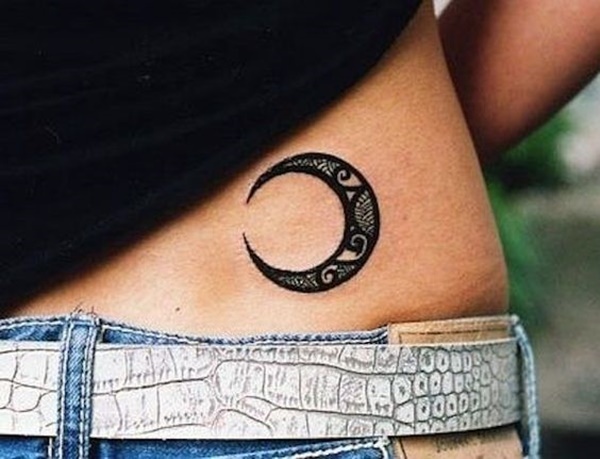 A crescent moon is stylized using elements of a mandala in this black tattoo rendered on the right side of the wearer’s lower back. 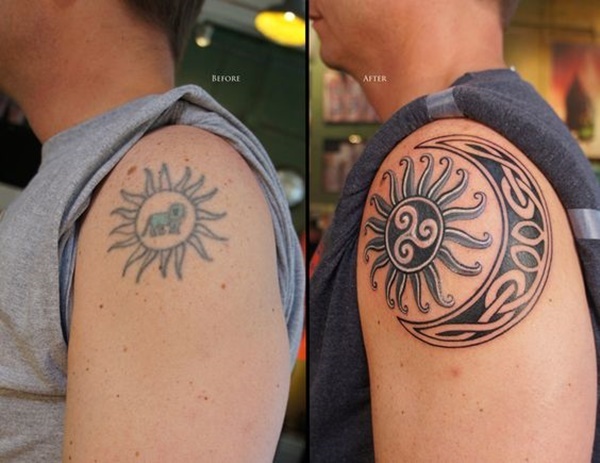 A tribal inspired crescent moon and sun are depicted in black and gray ink with white embellishments in this tattoo set. 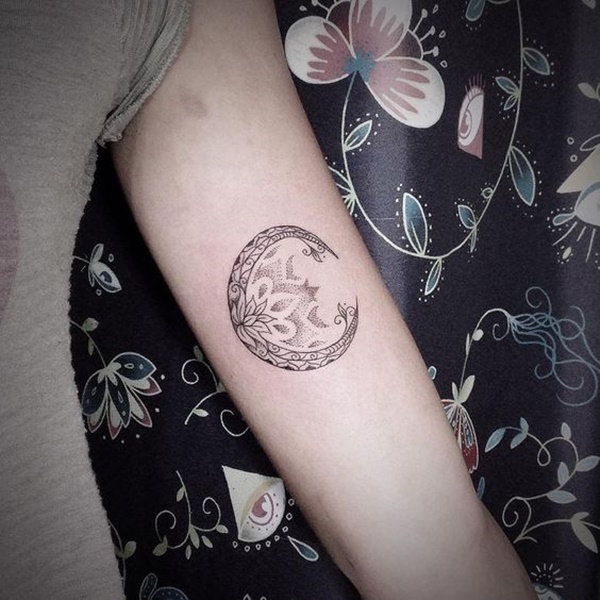 A personified crescent moon is adorned with flowers in this tattoo rendered on the wearer’s upper arm. 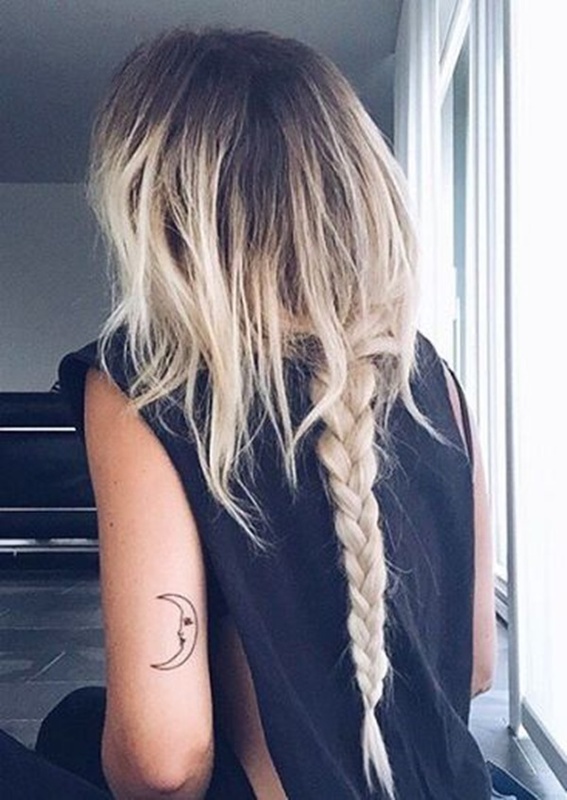 A blacked-out crescent moon is depicted at the base of the wearer’s neck in this simplistic tattoo. 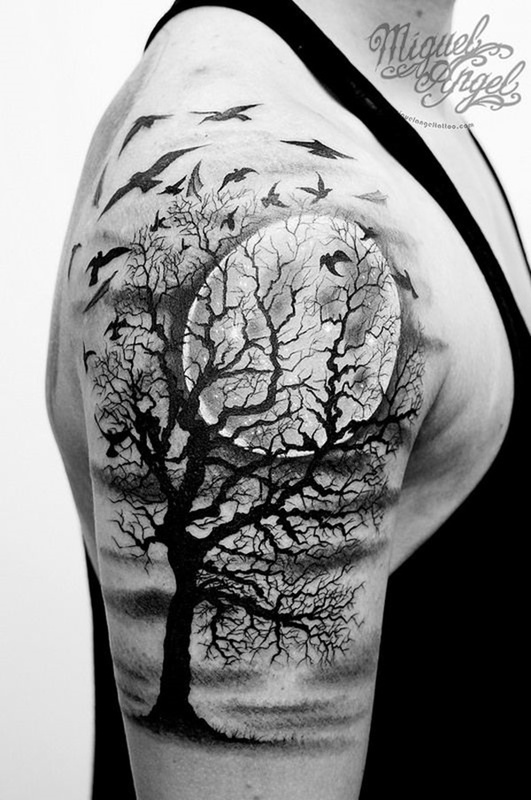 A barren tree is surrounded by a fleeing murder of crows while the moon sits in the background of this hyper-detailed tattoo depicted on the wearer’s bicep. 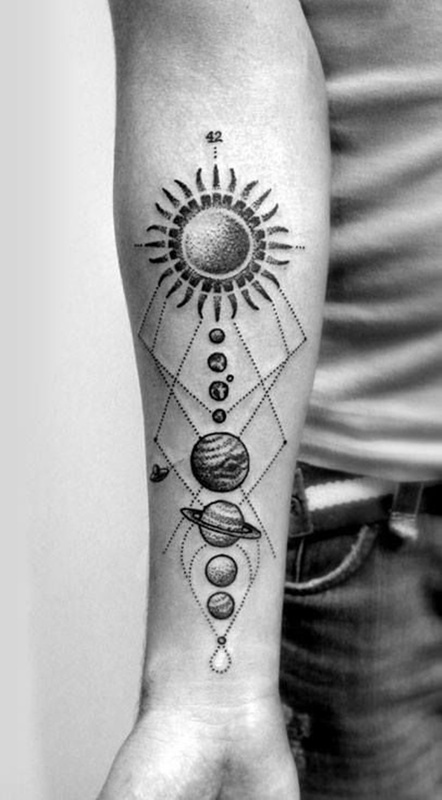 A collection of cosmic entities are strung together by a dotted line in this tattoo inked onto the wearer’s forearm. 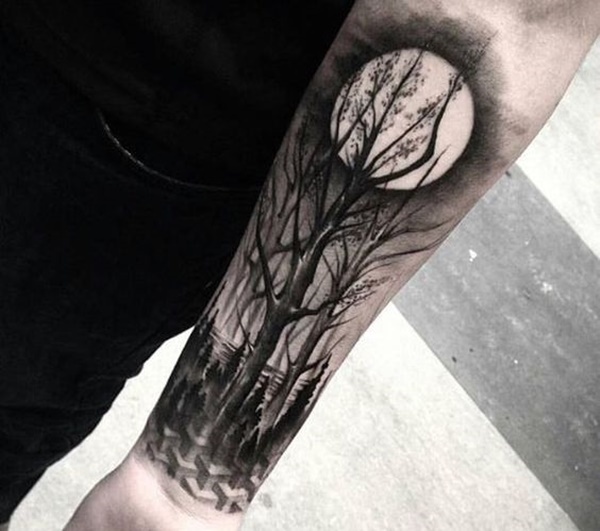 Here is another example of an excessive use of dark ink washing out the image of the moon. 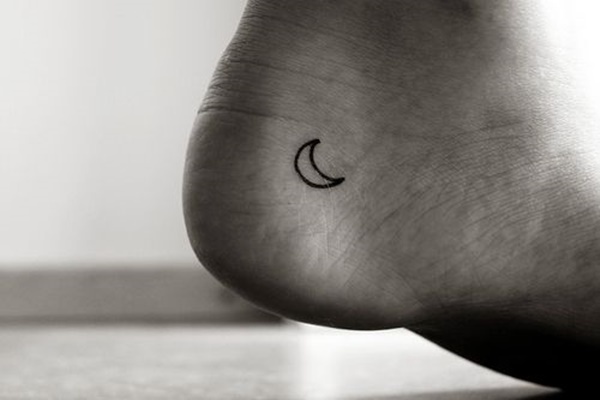 A personified crescent moon frames a five point star in this tattoo inked onto the wearer’s forearm. 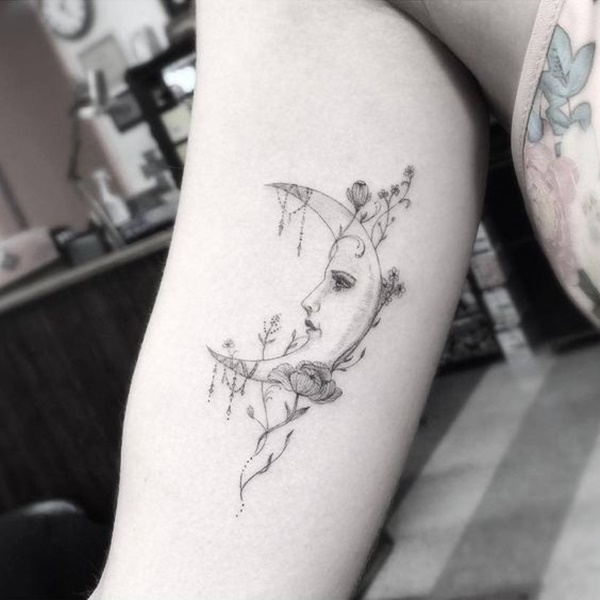 A crescent moon comprised of flowers has an outreaching branch with a bird perched on the limb. 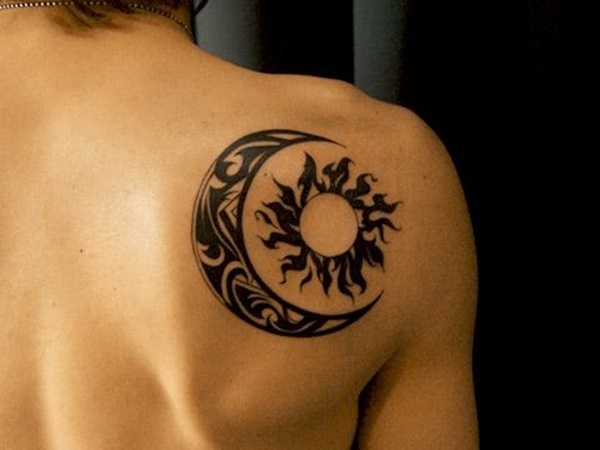 This tribal inspired tattoo, depicted in black ink, shows a crescent moon wrapping around a sun on the wearer’s right shoulder blade. 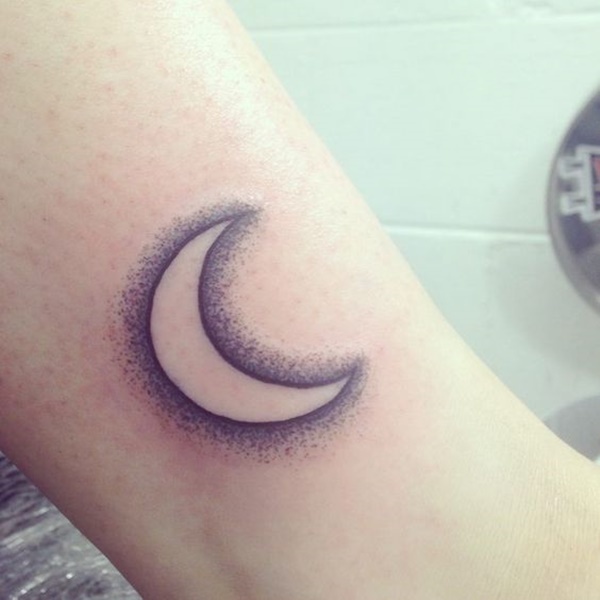 An outline of a crescent moon is depicted on the wearer’s left heel in this tattoo. 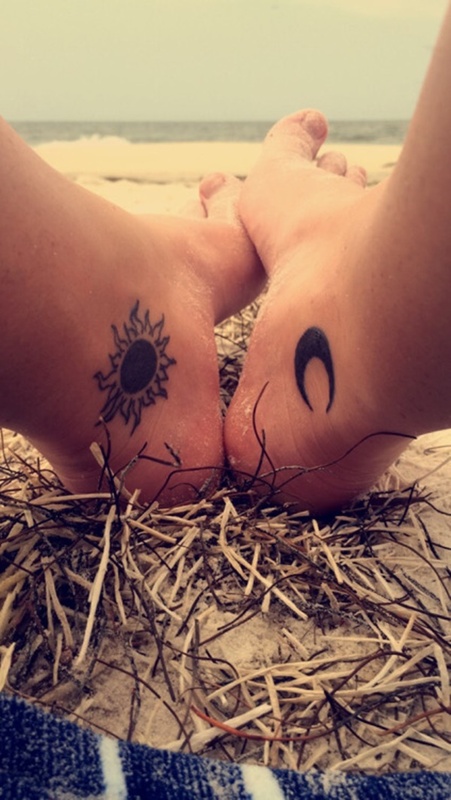 A black crescent moon outline and tribal sun are depicted on the underside of the wearer’s thighs in this tattoo set. 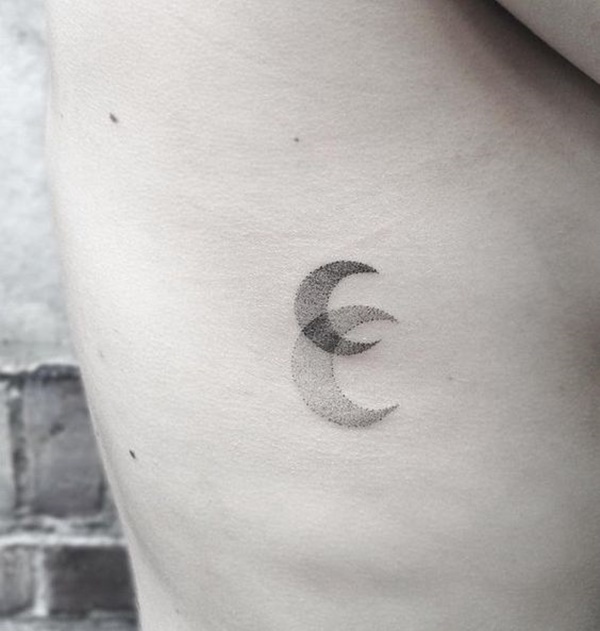 A crescent moon is embellished with dots surrounding the image in this tattoo that gives the effect of a glowing moon. 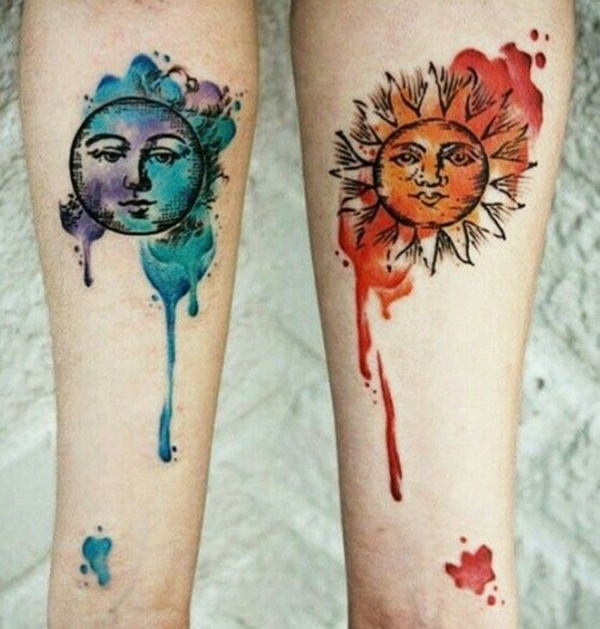 Personified depictions of the sun and moon are colored with smears of watercolors in this tattoo set. A vignette of a nighttime seascape shows a cresting wave with a whale tail sticking out of the water while a crescent moon sits in the background. A pair of crescent moons are created using a series of dots in this heavily textured rendering of the popular image. 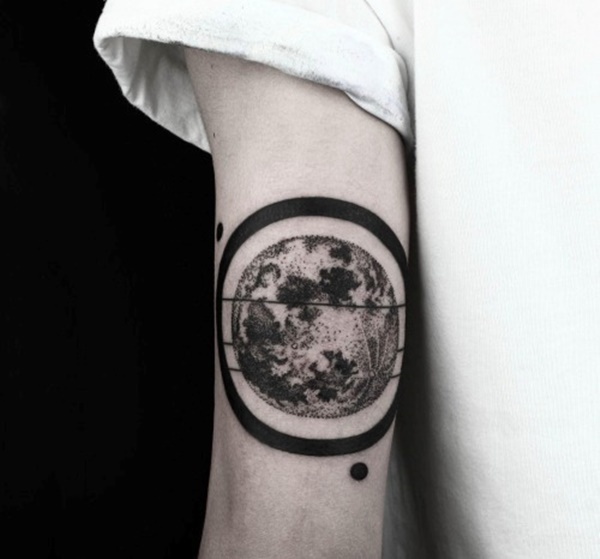 A stylized moon that incorporates elements of a mandala frames a stylized sun in this black tattoo rendered on the wearer’s left shoulder blade. 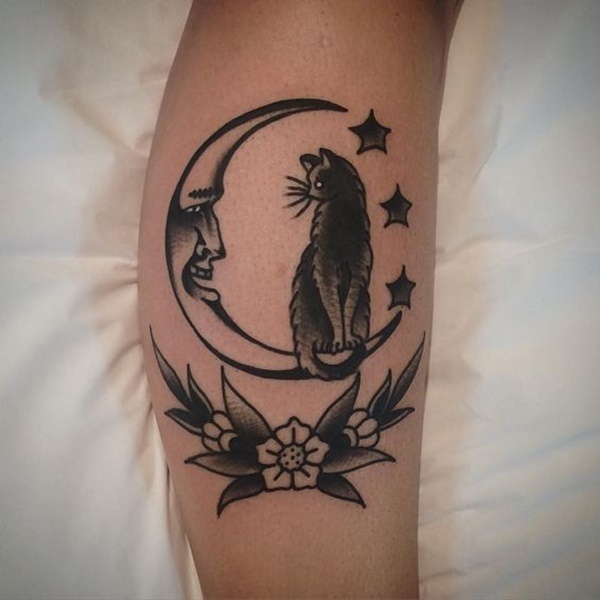 A black cat perches on a personified moon while the flowers and stars accent the main image in this tattoo. 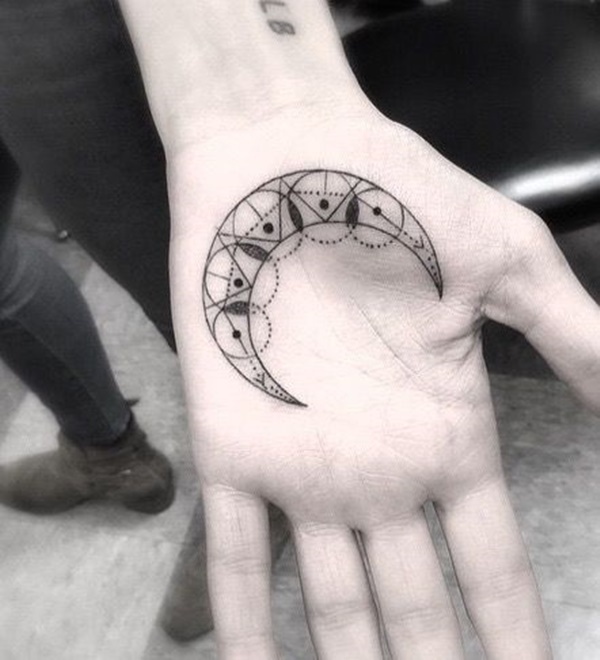 A crescent moon utilizes elements of a mandala in this tattoo rendered on the wearer’s left palm. 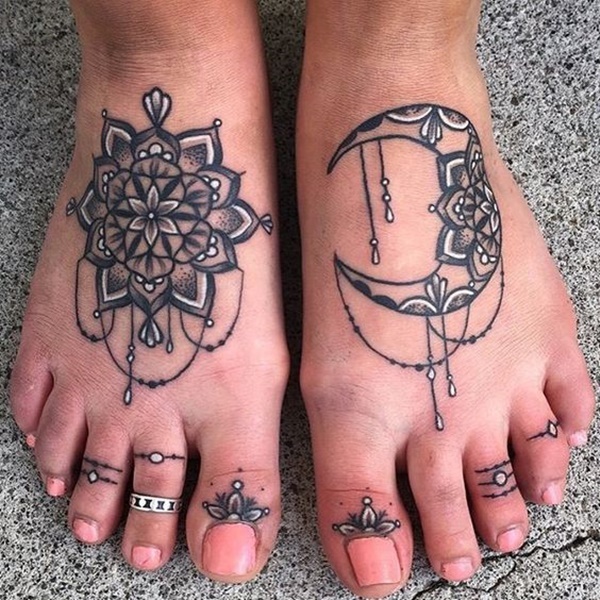 These black, gray, and white tattoos, depicted on the wearer’s feet, show a mandala and crescent moon with mandala elements. 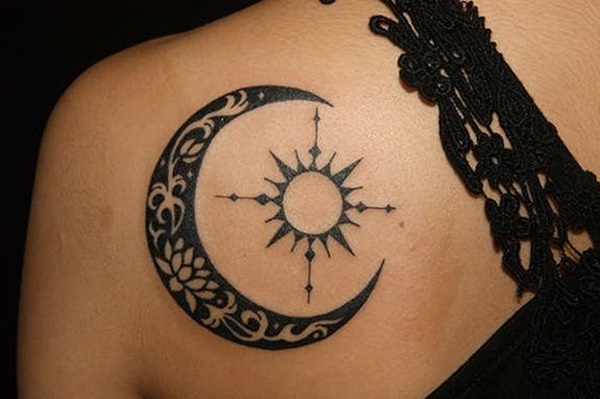 A simplistic, personified crescent moon is shown on the back of the wearer’s left arm in this tattoo. 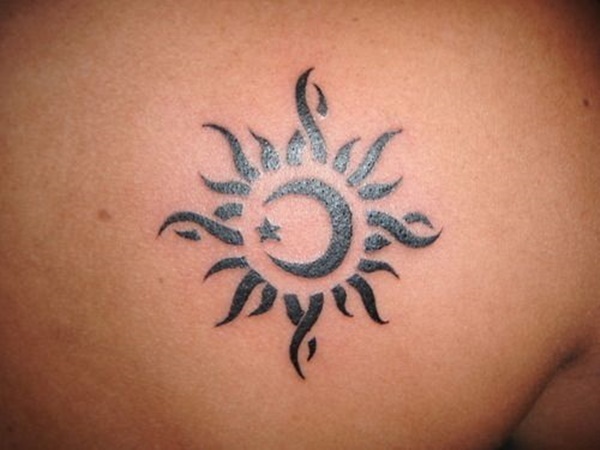 This black tattoo shows a crescent moon encapsulated in a sun and is portrayed in a tribal style. A landscape including rolling hills and a flowing stream is shown inside the shape of a crescent moon in this unique portrayal of the popular image. 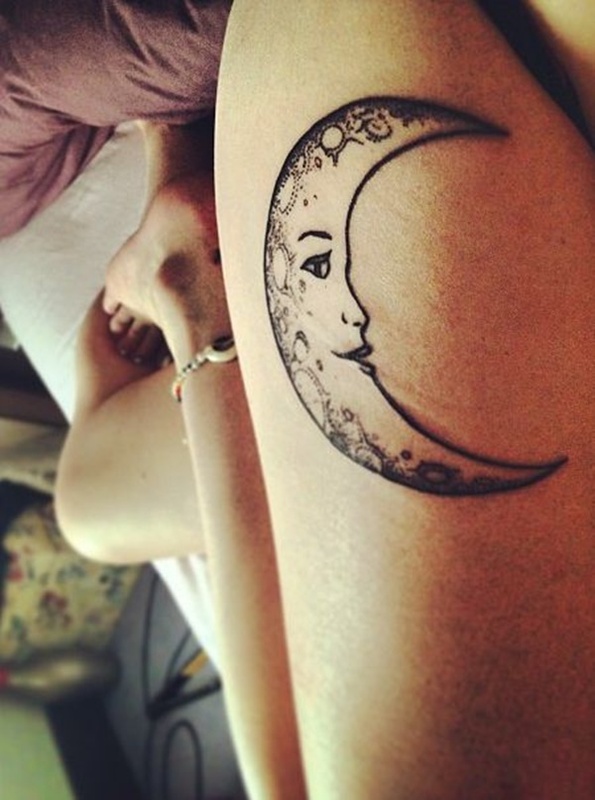 A personified crescent moon with feminine qualities is portrayed in black ink on the wearer’s thigh. 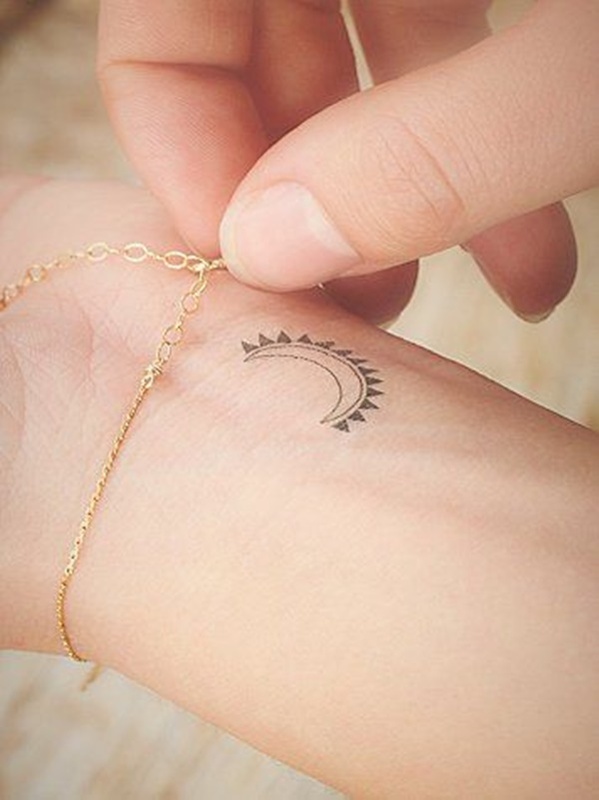 A crescent moon is accented with triangles in this simple piece portrayed on the wearer’s wrist. 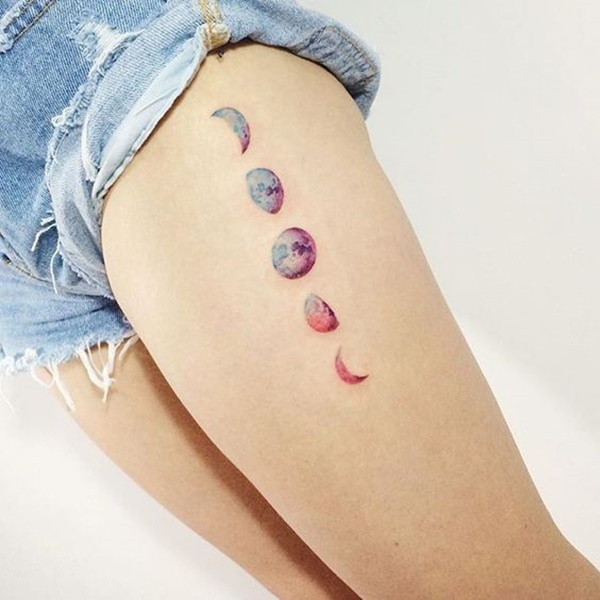 This beautiful version of the cycles of the moon uses a palette of pink, purple, and blue to breathe life into the piece. 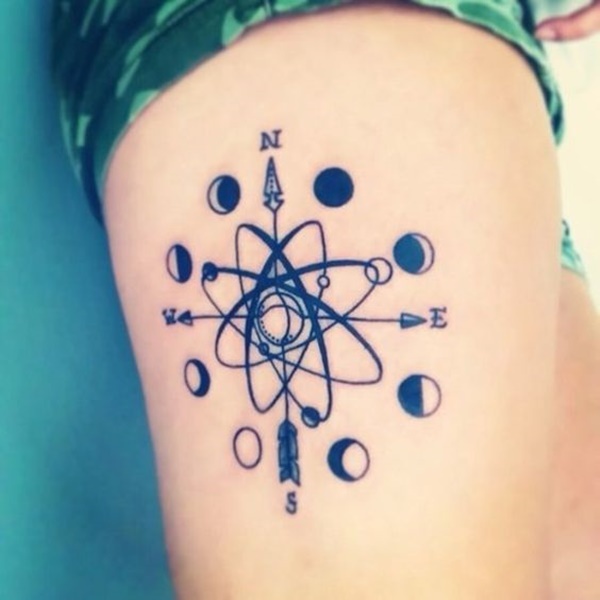 The cycles of the moon are depicted around an atom in this black tattoo. 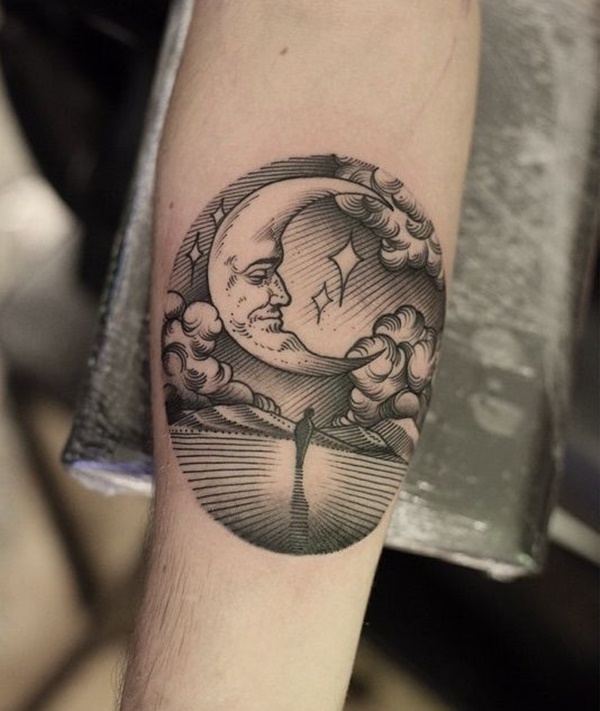 A silhouette of a person stares up at a personified crescent moon in this black and gray tattoo. A crescent moon utilizes elements of a mandala and is smeared with watercolors in this piece. 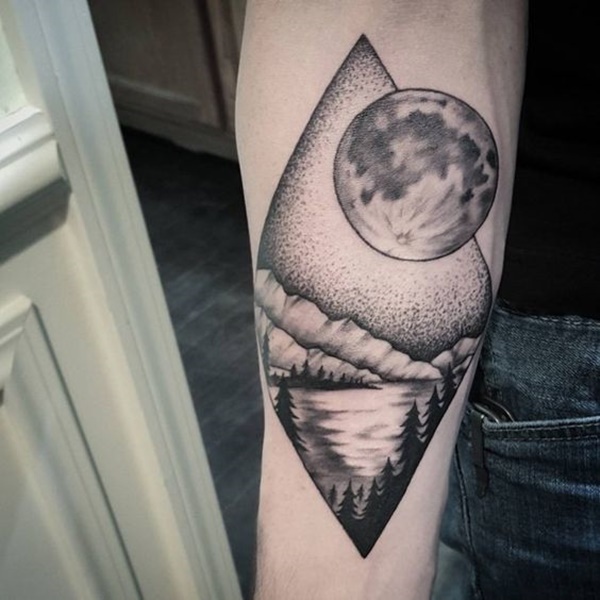 The moon looms over a landscape including pine trees, mountains, and a river in this black and gray tattoo. 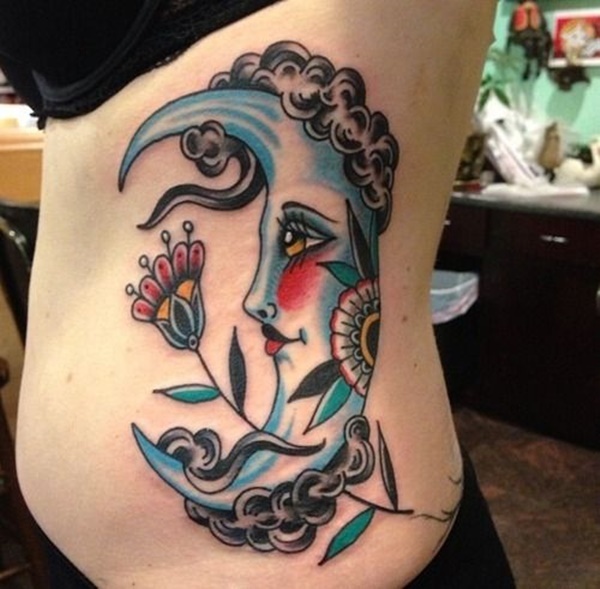 Traditional tattoo styling is used to create this image of a personified crescent moon utilizing a palette of blue, pinks and yellows. 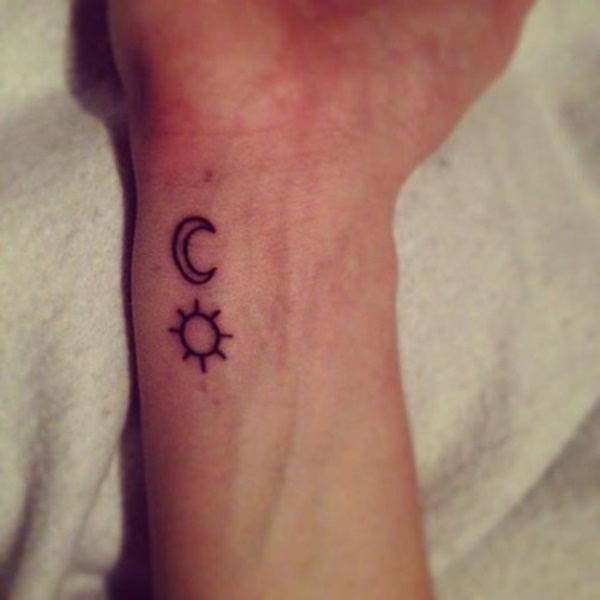 A crescent moon is accented by a pair of stars in this wrist tattoo. 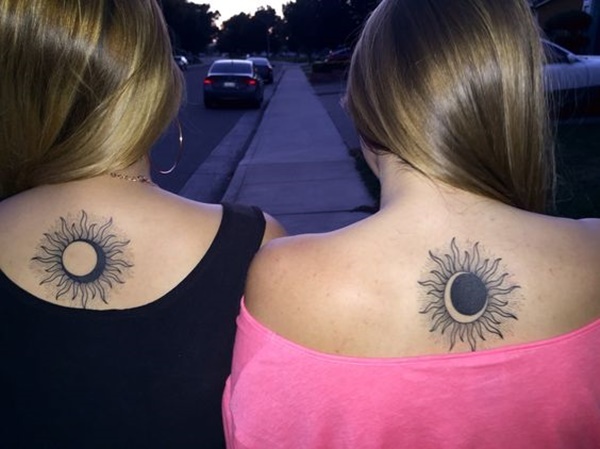 The moon and sun are depicted in tribal styles in this black wrist tattoo set. 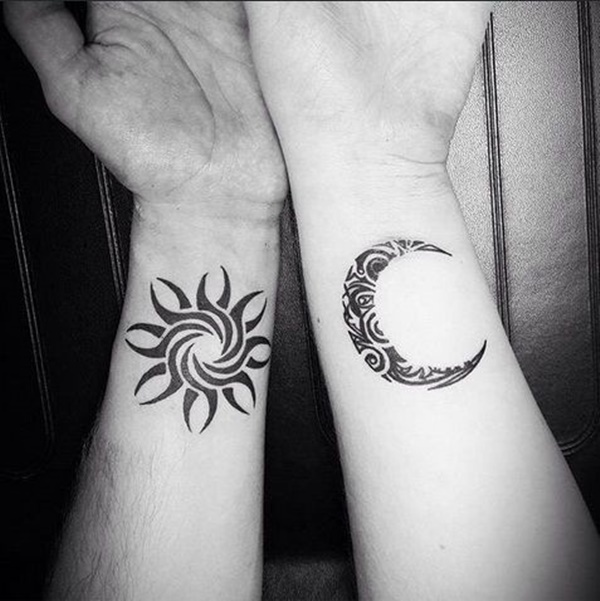 This blacked-out tattoo shows a personified sun and moon nearing for a kiss. 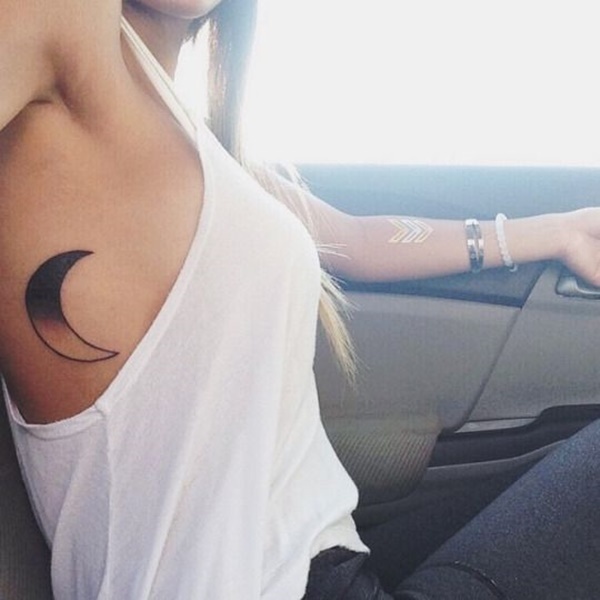 A half-black, half-white crescent moon is depicted on the wearer’s ribs. Mother nature closes the distance to kiss a personified crescent moon. 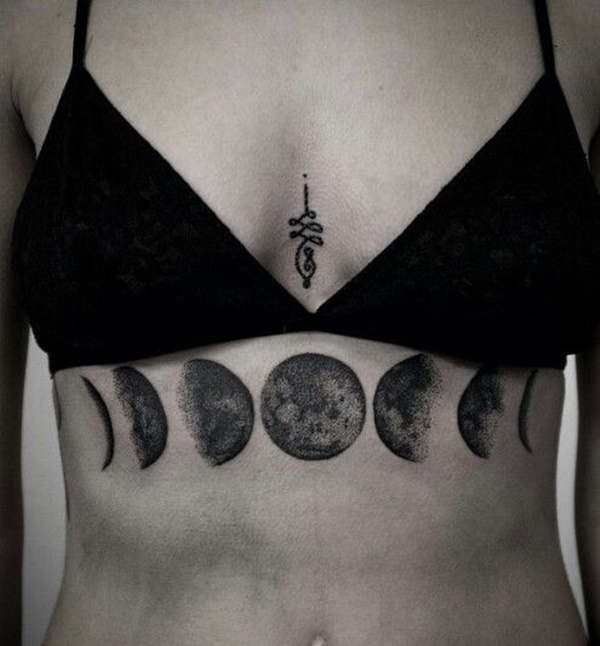 The yin represents the sun while the yang represents the moon in this tattoo set. 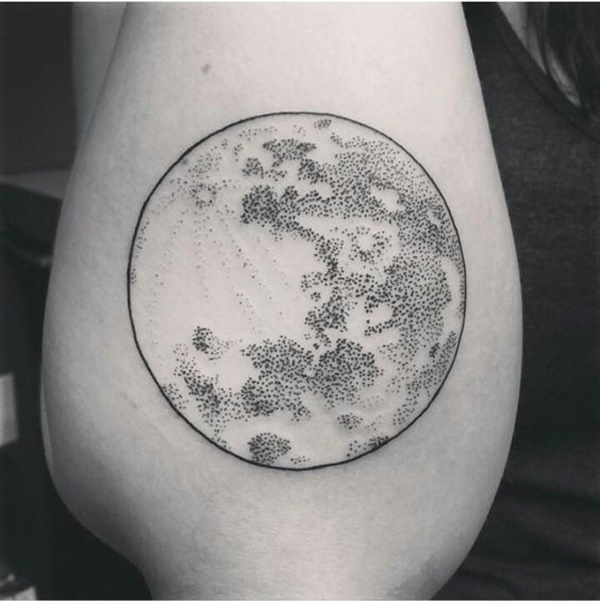 The cycles of the moon are embellished with line-work in this forearm tattoo. 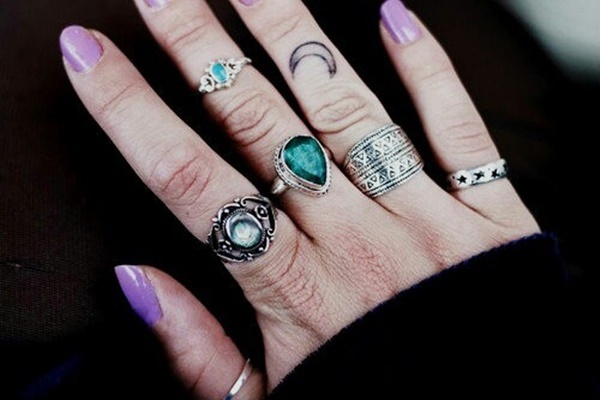 A miniature crescent moon is depicted on the wearer’s middle finger. 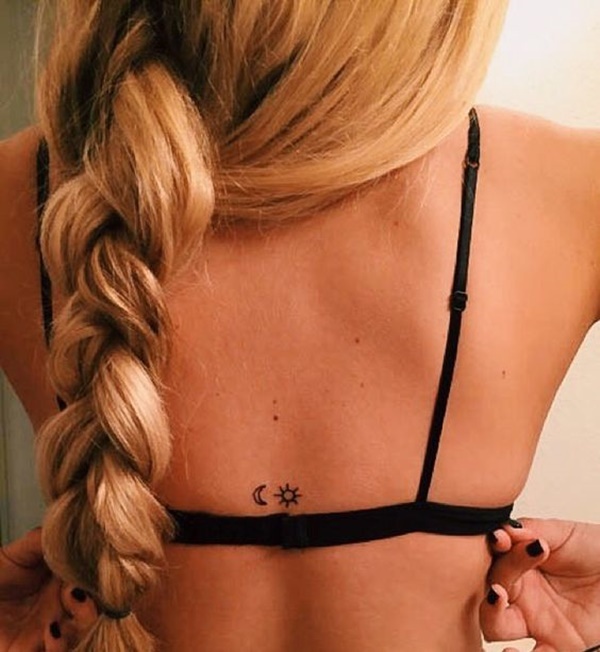 A personified sun sits between a pair of crescent moons in this back tattoo. A thin crescent moon is accented with flower like shapes throughout the image. 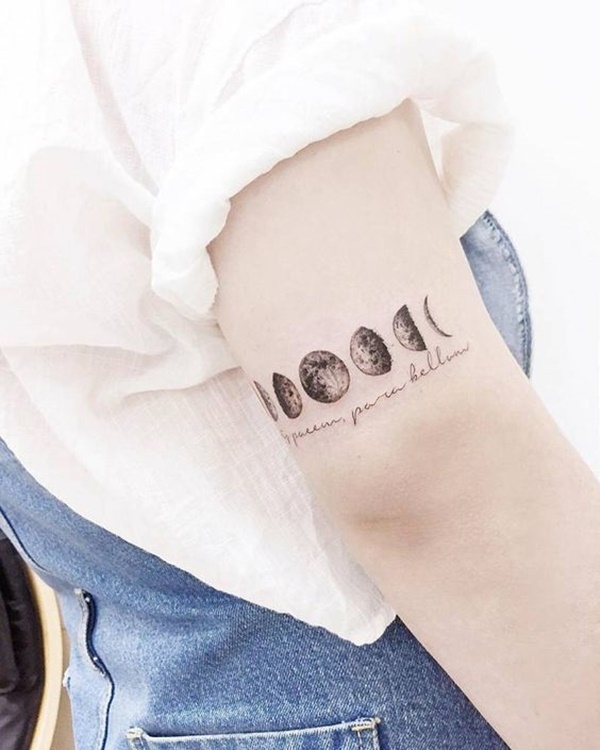 A realistic depiction of the cycles of the moon sit above a quote in this tattoo. 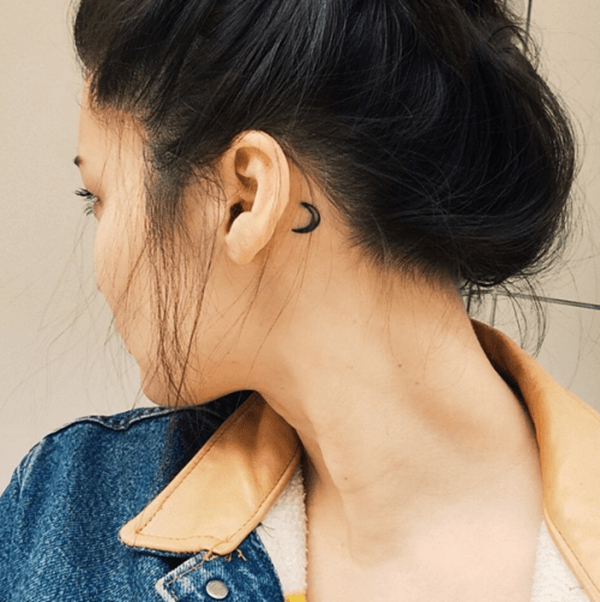 A dark crescent moon sits behind the wearer’s right ear. 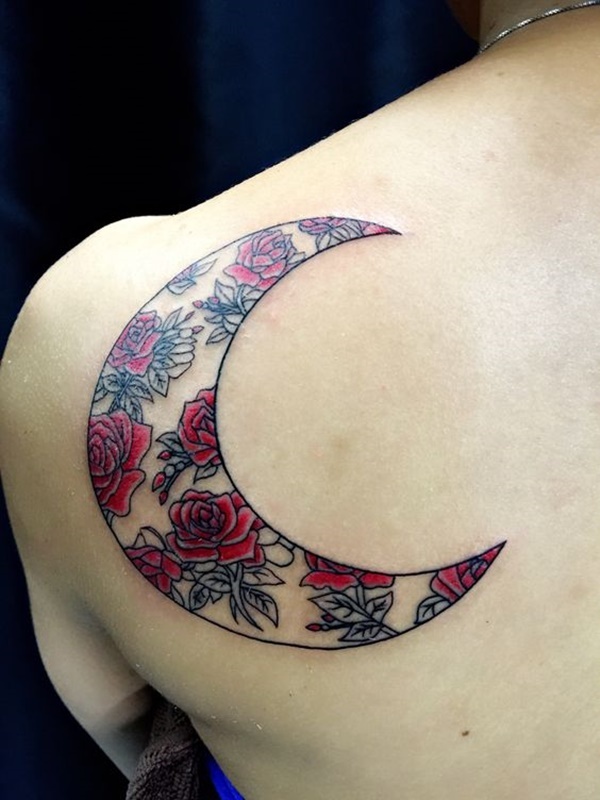 A crescent moon is filled with red roses in this tattoo inked onto the wearer’s left shoulder blade. 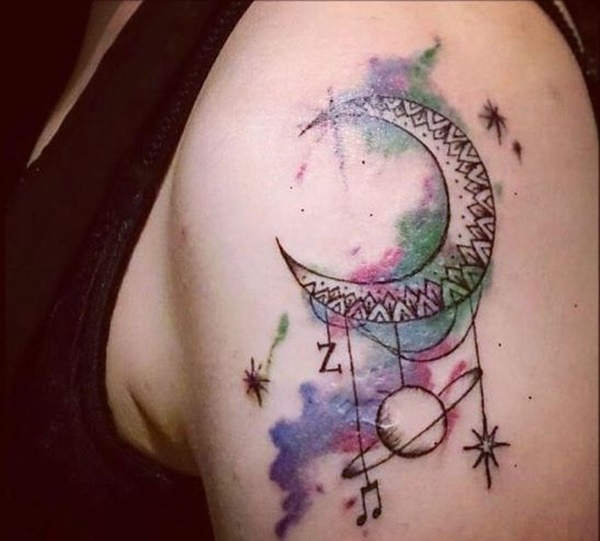 This beautiful tattoo utilizes an abundance of white ink to create a crescent moon embellished with tribal designs and white stars. 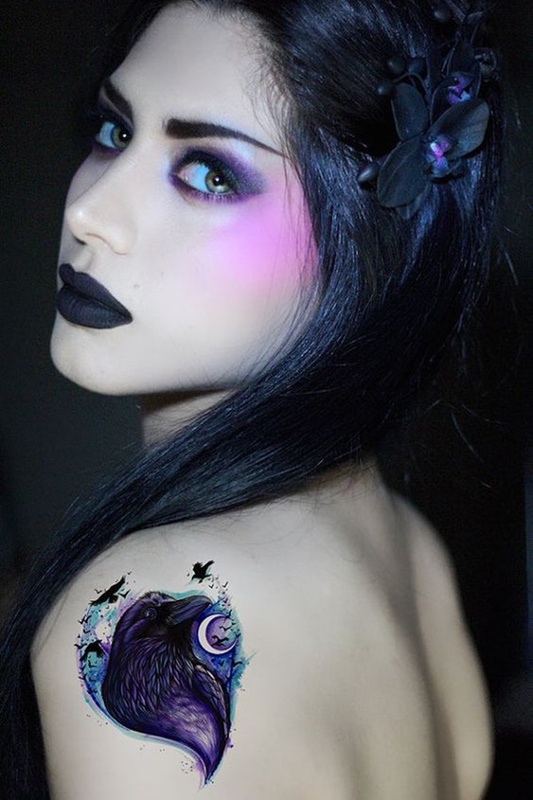 The portrait of a raven is accented by a crescent moon and is created using a palette of blues and purples. 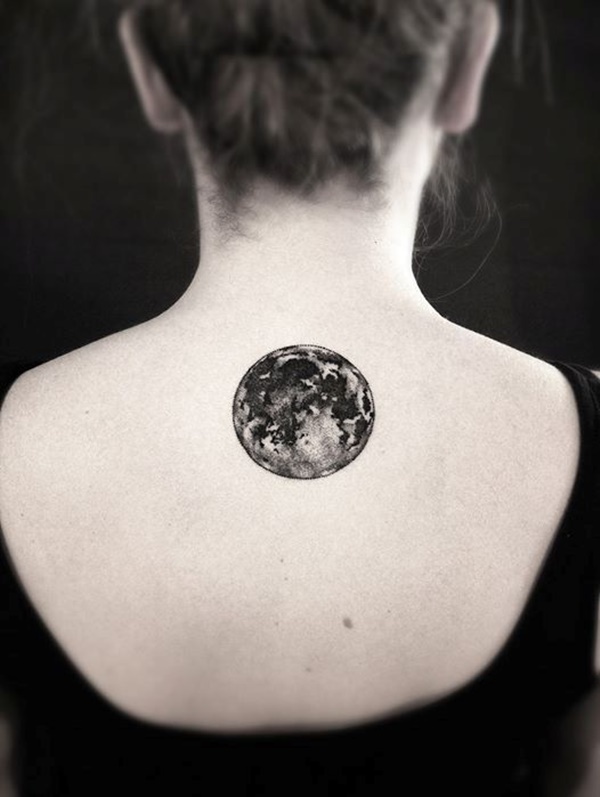 A realistic depiction of the moon is inked near the wearer’s right shoulder. 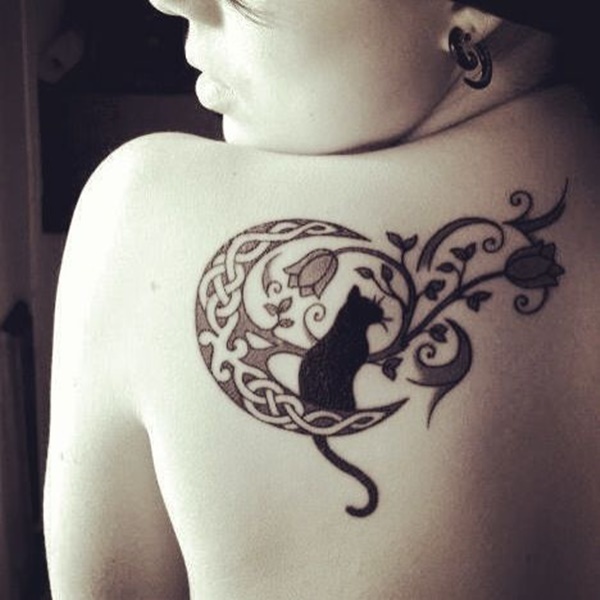 A cat perches on a moon detailed with mandala elements. 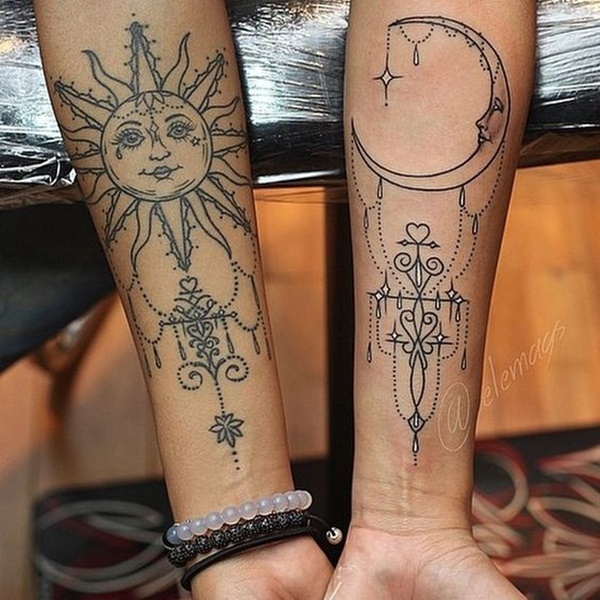 A sun and moon are accented with hanging beads. 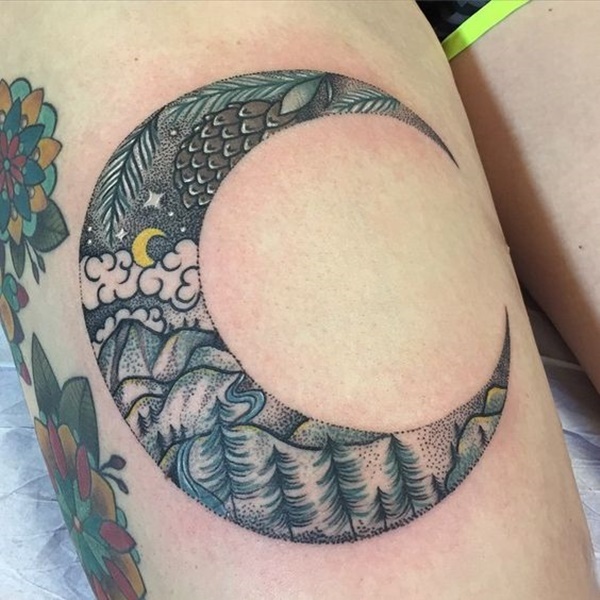 A pair of moons are detailed using a series of dots as seen in the art style of pointillism. 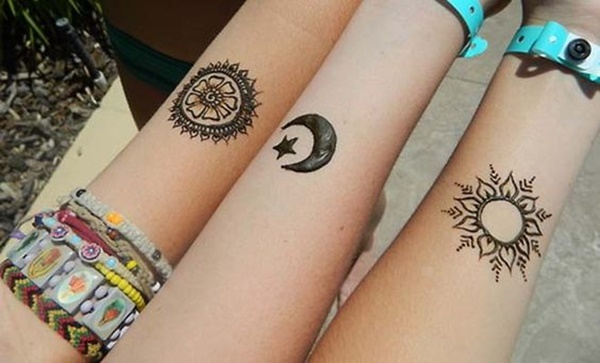 A crescent moon is accented by depictions of wind and a series of dots. 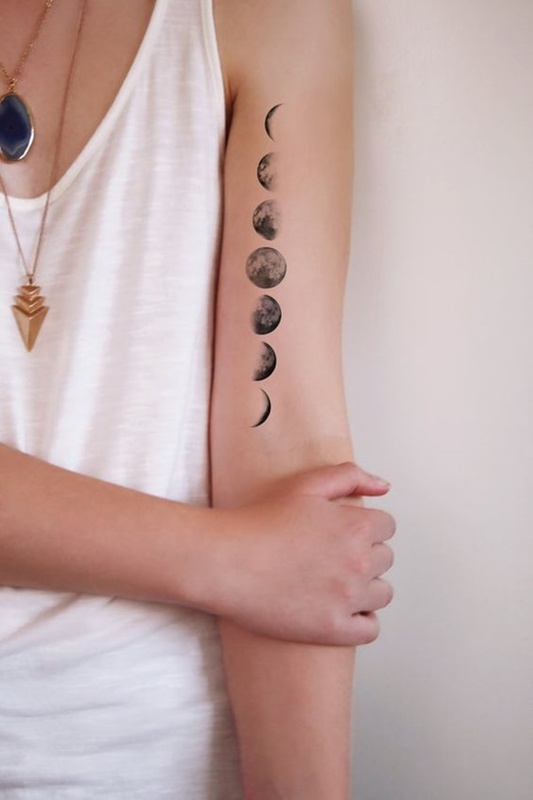 The moon cycle is shown stretching across the width of the wearer’s torso. 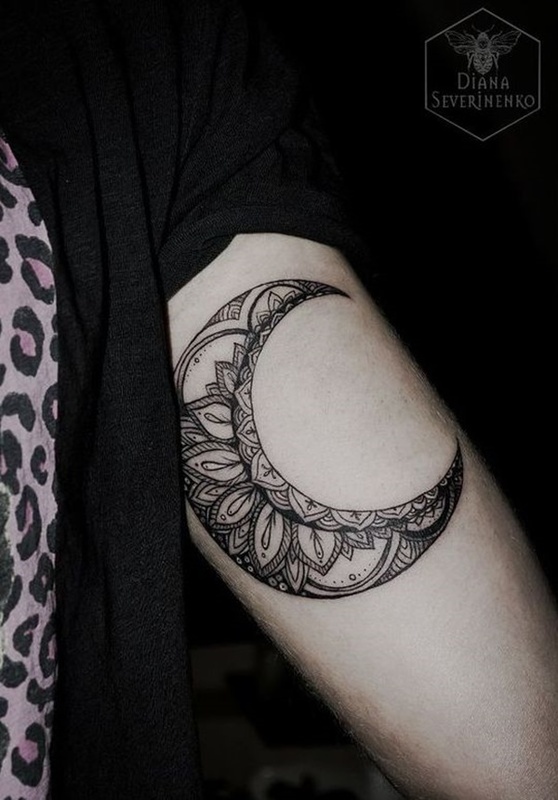 Another example of a crescent moon detailed with mandala elements. 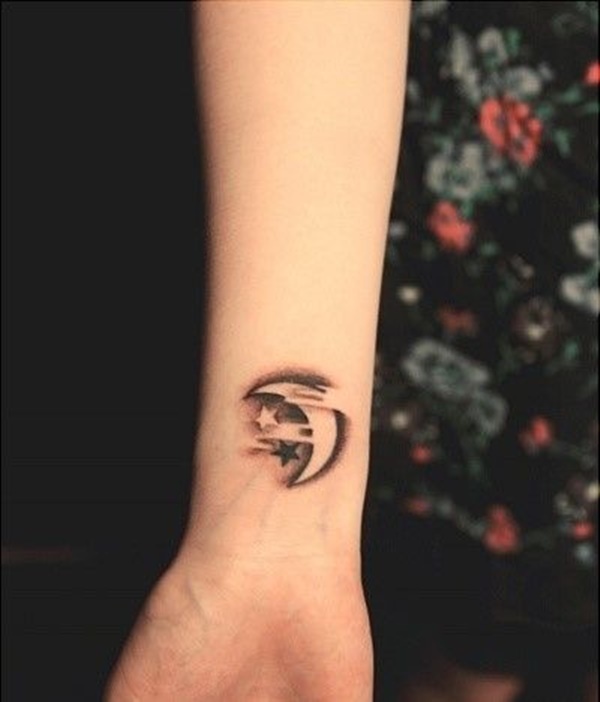 A crescent moon is accompanied by other symbols in this wrist tattoo. 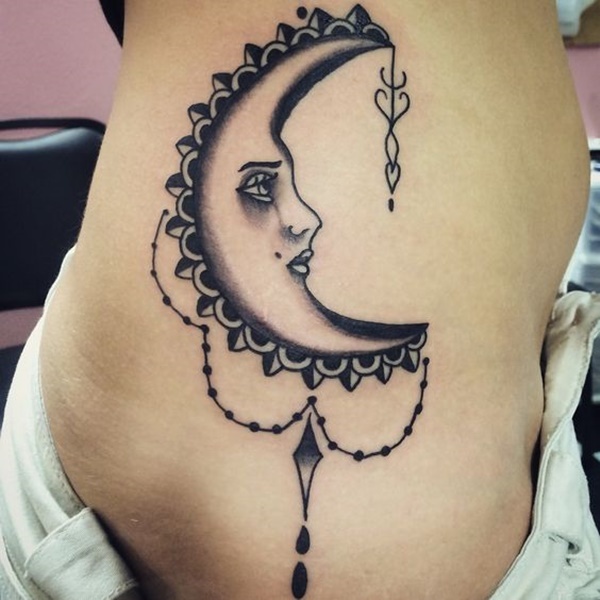 A crescent moon is embellished with hanging beads. 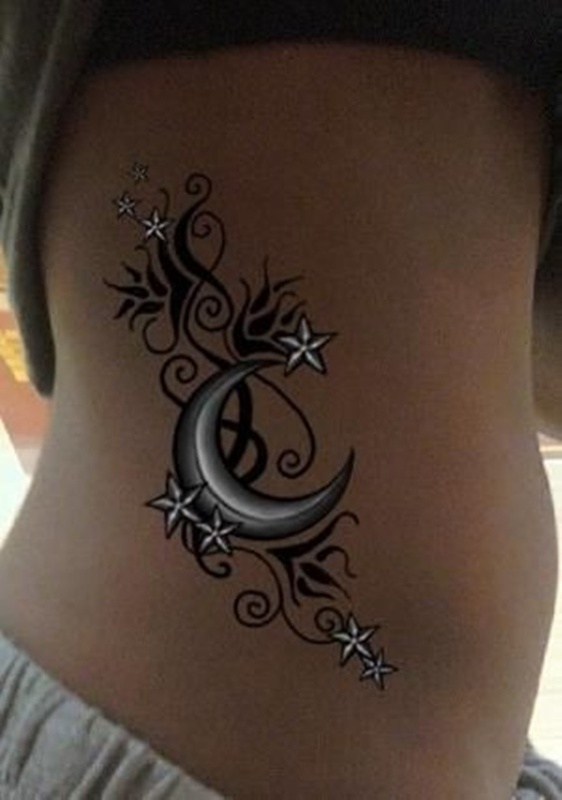 Another example of a crescent moon embellished with beads. 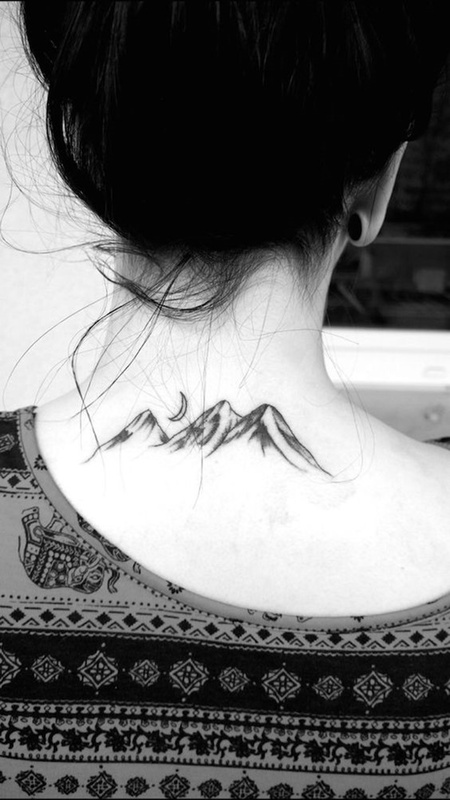 The moon looms over a mountainscape in this tattoo. 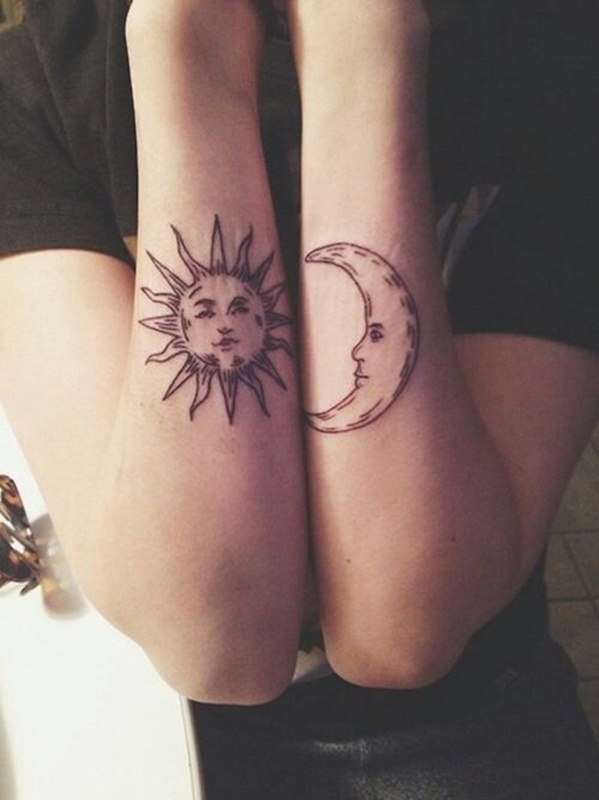 The moon and sun are outlined in this wrist tattoo set. 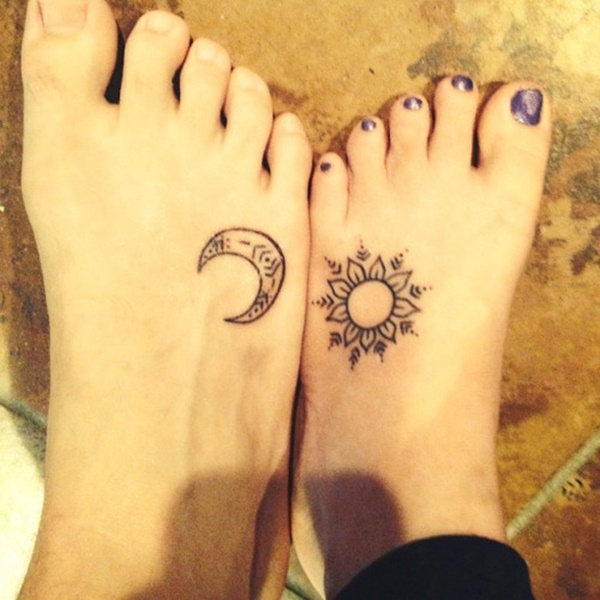 A stylized sun and moon adorn the wearer’s feet in this tattoo set. 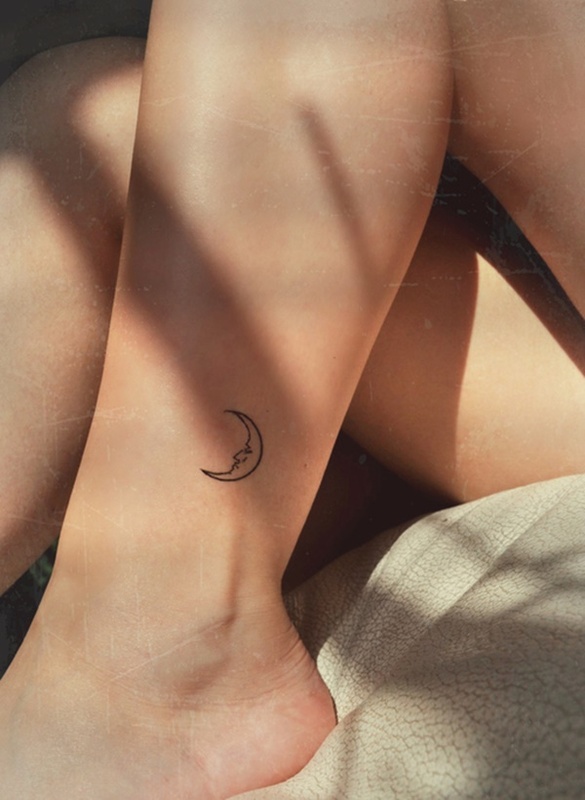 Another example of a personified crescent moon is rendered in black ink on the wearer’s leg. 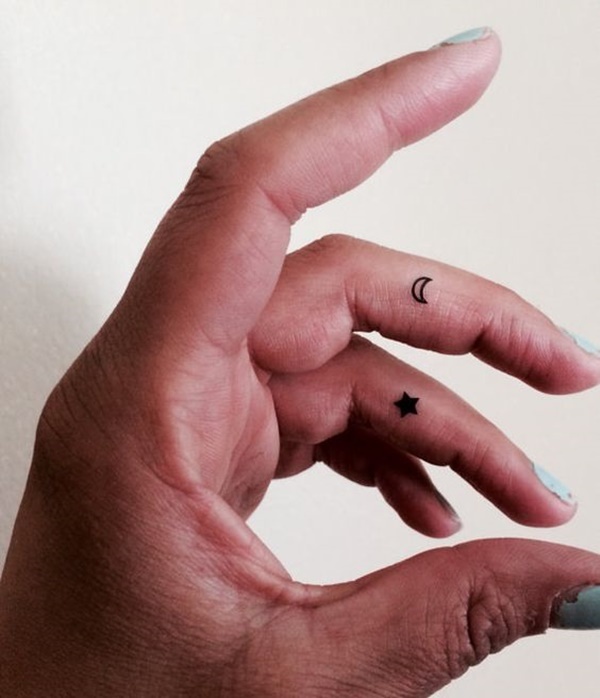 A crescent moon outline is shown on the wearer’s ring finger. 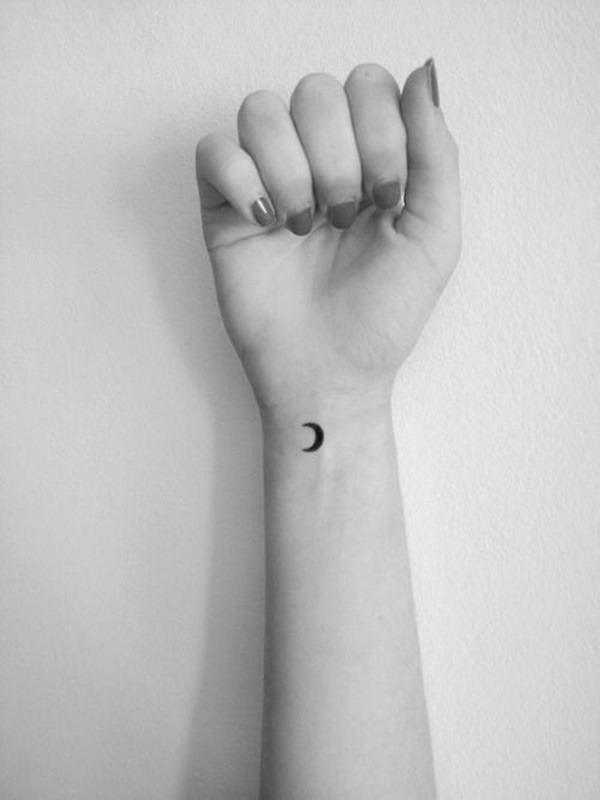 Another example of a crescent moon outline is shown on the wearer’s wrist. A full moon is sandwiched between two crescent moons. 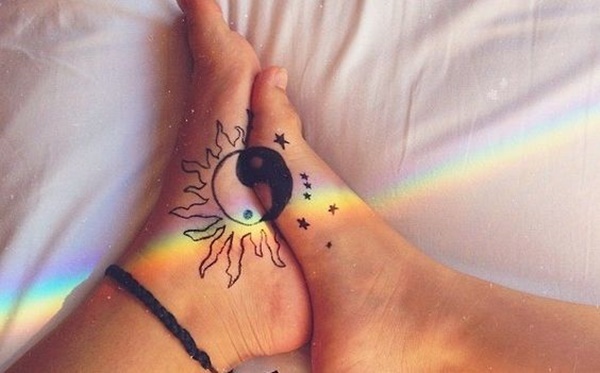 Dark renderings of the sun and moon are portrayed on the wearer’s heels. A moon is surrounded by a black circle. 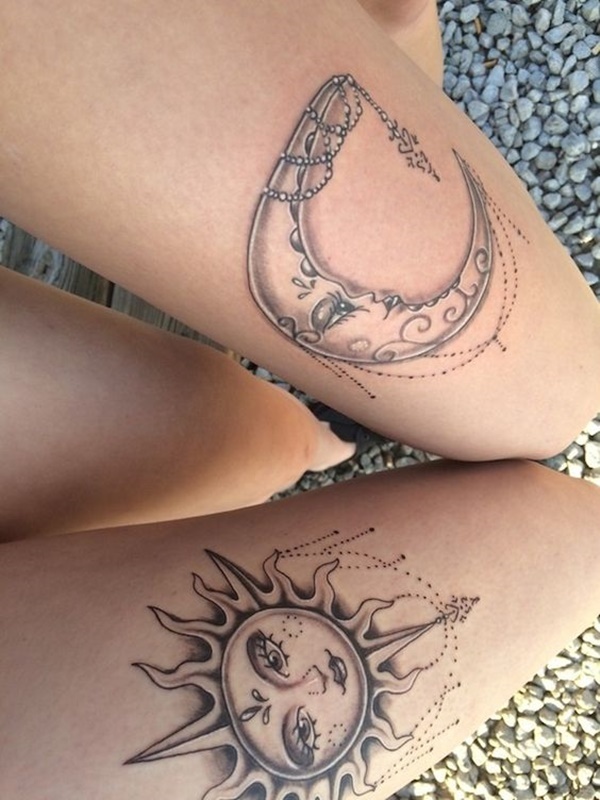 The outlines of a moon and a sun are rendered on the wearer’s thighs alongside a portrait of the Indian goddess Ganesha. 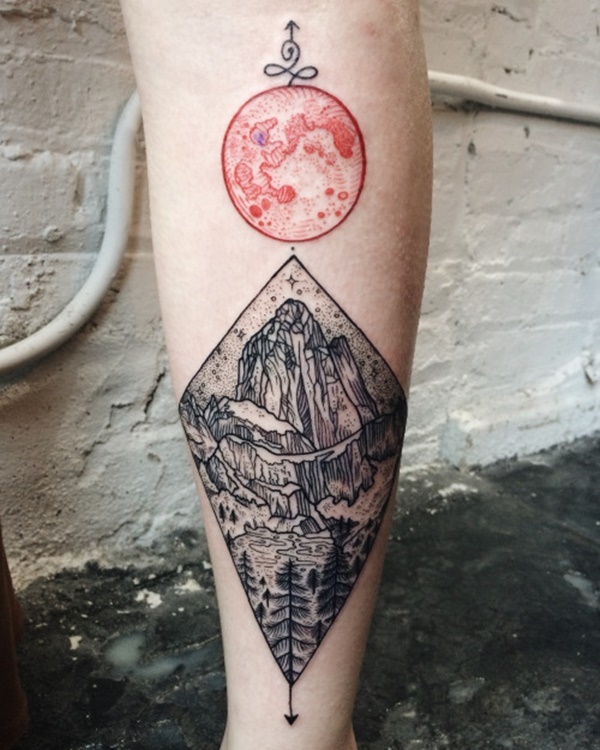 A red moon sits above the vignette of a mountainscape. 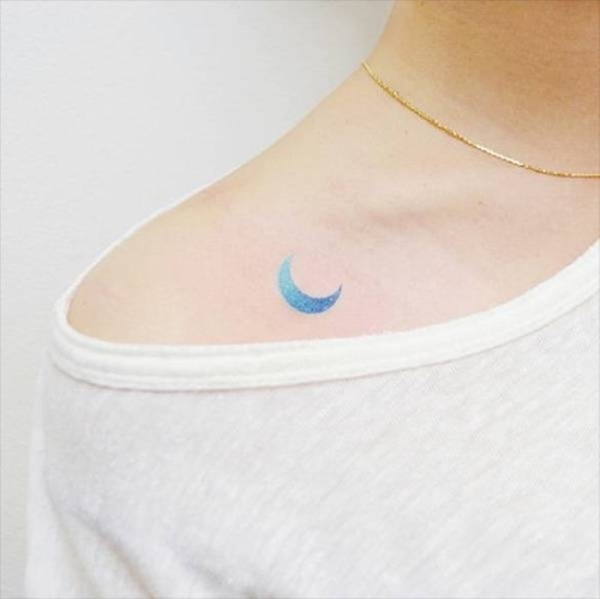 A blue moon is inked on the wearer’s right collarbone. 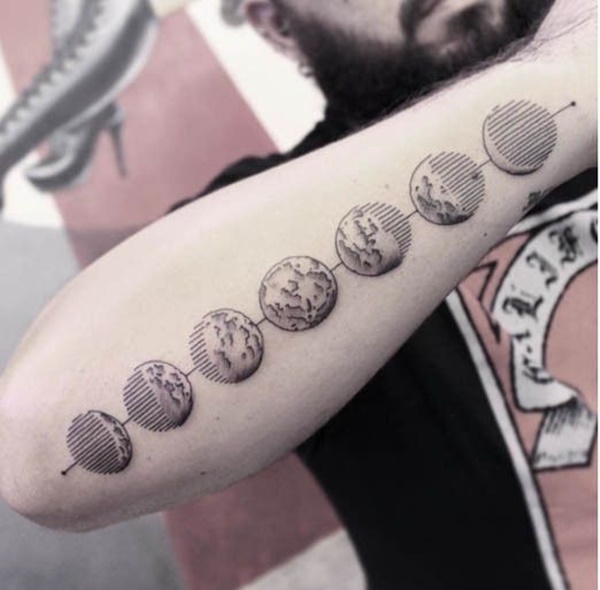 A hyper-simplified rendering of the moon cycles is portrayed on the wearer’s wrist. 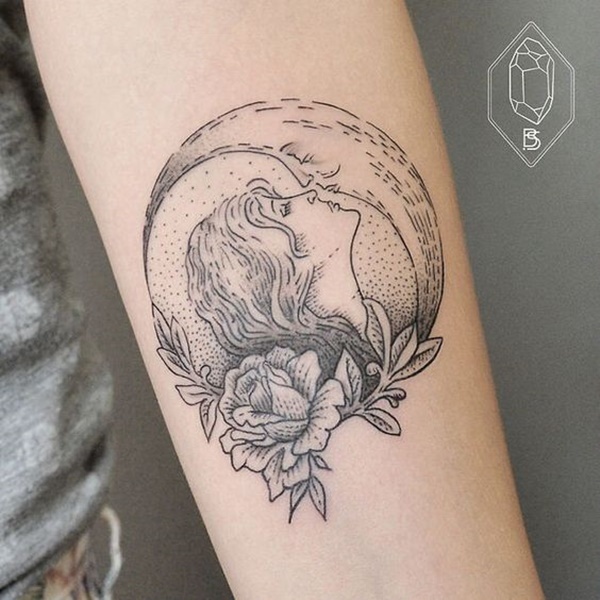 A realistic depiction of the moon is accented by flowers on either side.